It had been a long, hot summer in 1666 and the city of London was crowded with overhanging wooden buildings that were tinder dry. Legend suggests that someone was a little careless in a bakery on Pudding Lane, although the baker swore in court that his fires had all been put out that night. At the time blame was laid on French or Dutch conspirators and it was also suggested that it was a Papist plot. Titus Oates blamed Jesuit priests for setting fire to the city. And after an investigation into the cause of the fire a French Protestant watchmaker, Robert Hubert, confessed to having deliberately started it and was hanged at Tyburn. But other people accepted that it was an ‘act of God’. There was a strong east wind and the fire spread. It burned for several days and at its worst it reached St Paul’s Cathedral where wooden scaffolding caught fire followed by the timber roof beams. The lead of the roof melted and flowed down Ludgate Hill. Stones exploded from the building and within a few hours the Cathedral was a ruin. 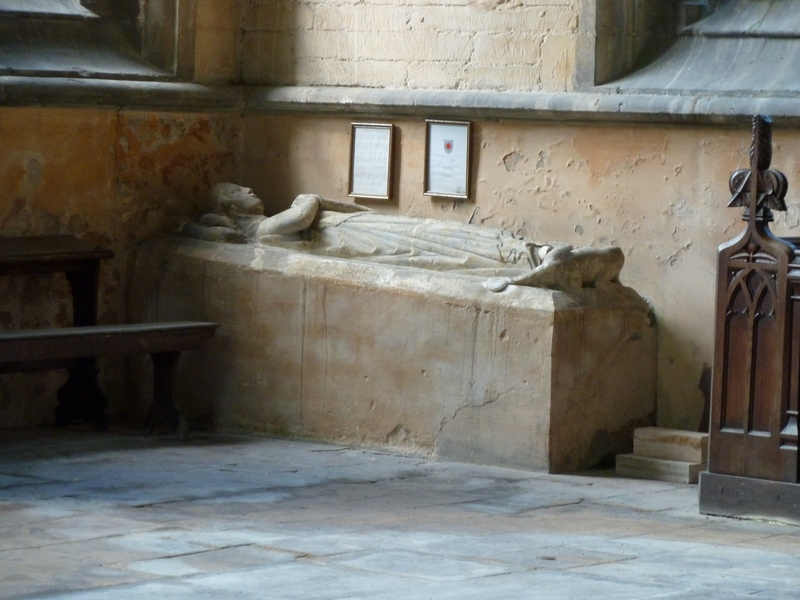 Within the Cathedral, was the body and tomb of Henry de Lacy, earl of Lincoln, who died on 5th February 1311. Henry de Lacy was buried in St Dunstan’s Chapel in St Paul’s. 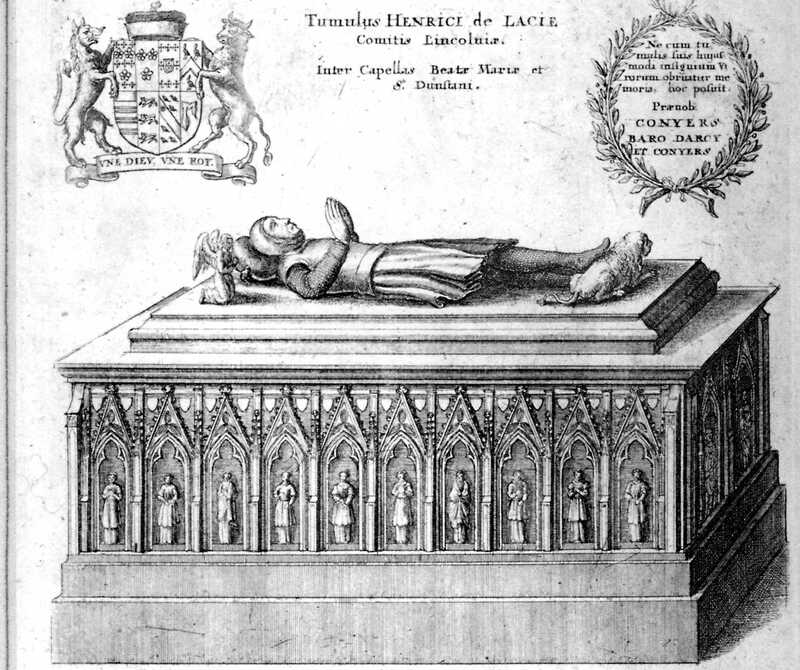 His monument was described as ‘an elaborately ornamented altar tomb on which was a recumbent armed effigy of the earl, with hands placed in the attitude of prayer, a lion at the feet, and angels supporting a pillow for the head’. There is information there about the recent rediscovery of the actual site of the battle which is a short distance from the visitor centre. 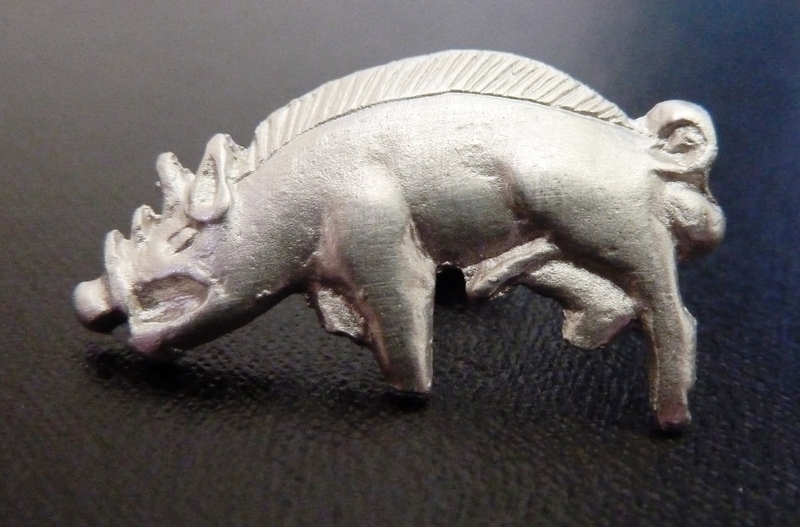 It was here, in September 2009, that a small gilded silver boar badge was discovered which was almost certainly worn by a knight in Richard’s retinue – one of those brave men who accompanied him in his fatal charge to defeat Henry Tudor. One of those men was Sir James Harrington and the badge may have been his. His father Sir Thomas Harrington and his eldest brother John had both died at the battle of Wakefield in 1460, fighting for the Yorkist cause. Tragic though that was it was timings of their deaths that caused a huge problem for the remaining Harrington family. 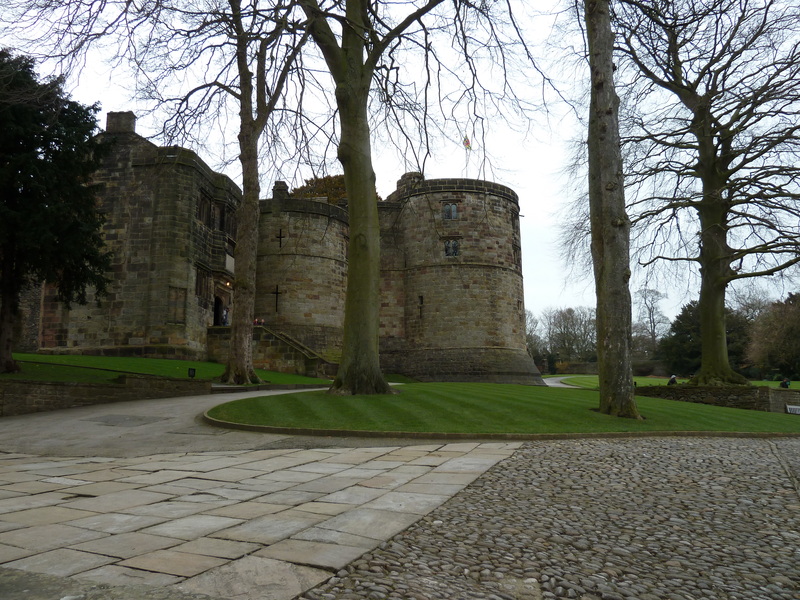 Because Thomas died at the battle and John died from his wounds later the Harrington estates, which included the strategically placed Hornby Castle in north Lancashire passed from father to son and then to John’s heirs. John Harrington’s heirs were his two young daughters – Anne and Elizabeth – who were aged around four and five years old at this time. As they were not old enough to inherit they were taken into the care of the king, Edward IV, and their wardship was given to Sir Thomas Stanley who was quick to arrange marriages for them with one of his sons and a nephew. What this meant was that Hornby Castle now belonged to the Stanleys and the Harrington family were virtually dispossessed. But James Harrington and his younger brother Robert refused to give up the castle. Thomas Stanley was infuriated and brought up a cannon to persuade them otherwise. At this time, Richard was duke of Gloucester and aged around seventeen years old. He could see the unfairness of what had happened and, after failing to persuade his brother, the king, that the arrangements should be changed he rode to Hornby to help the Harringtons defend it against Stanley. This was the beginning of the emnity between Richard and Thomas Stanley which resulted in Stanley deserting him for the cause of his stepson, Henry Tudor, at Bosworth. 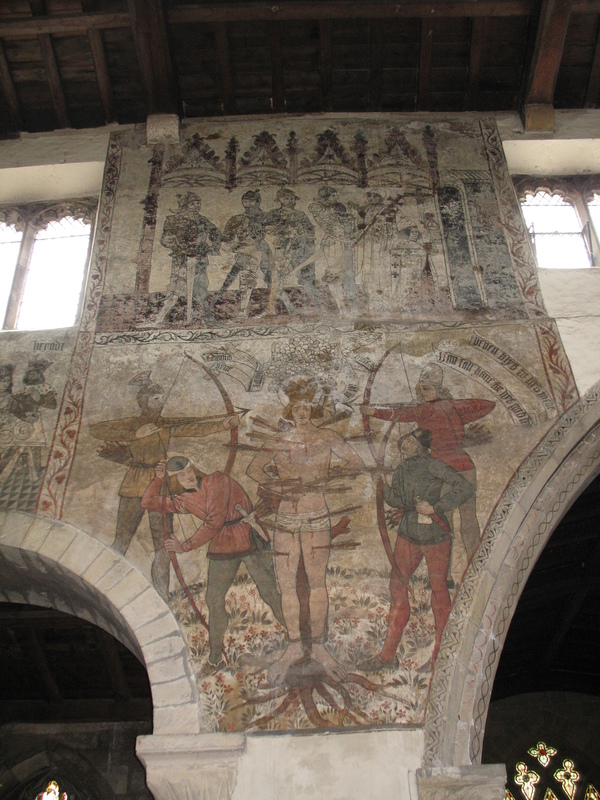 In 1465, James Harrington was one of the men who captured Henry VI who had been hiding out in Lancashire. 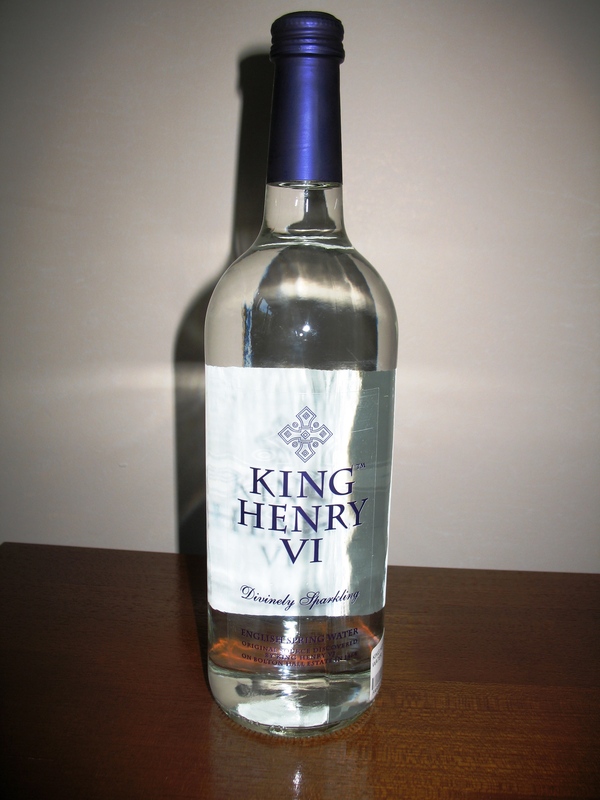 He was delivered to Edward IV who kept him captive in the Tower of London. I think that James Harrington may have hoped that this act of loyalty would make Edward look more favourably at his claim to Hornby, but although James was rewarded the castle was not returned to him. Later, after the defeat of the earl of Warwick, both James and Robert Harrington were later taken into Richard’s household and were amongst the select group of his personal retainers. They would have both worn a small silver gilt boar badge to show their status and their loyalty to Richard. 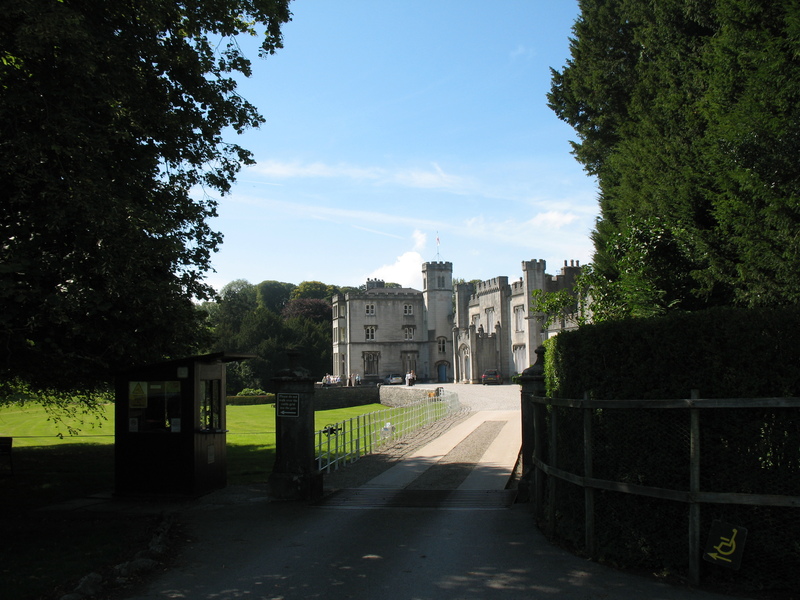 When he became king, Richard expressed his intention of re-opening the debate about the ownership of Hornby Castle. He was still determined that it should be returned to James Harrington. Of course, the idea infuriated Thomas Stanley. His son Edward was married to Anne Harrington and was living at Hornby and was not prepared to hand it back. So, on the morning of the 22nd August, 1485, when Richard rode into battle with the Harrington brothers at his side, Thomas Stanley decided to fight against them. Richard was killed. James Harrington escaped with his life and fled, possibly losing his badge in the mud of Bosworth Field to be found over 500 years later. Some of you may already know that I’ve written a novel about this story. It’s provisionally titled By Loyalty Bound and is still awaiting publication. I hope that I can share this story with you soon. Not only does it suggest that Richard’s support of the Harrington family was a factor in the Stanleys’ decision not to fight for him at Bosworth, it also introduces the intriguing idea that Anne Harrington could have been the mother of his children John and Katherine. Could this be Alice de Lacy? 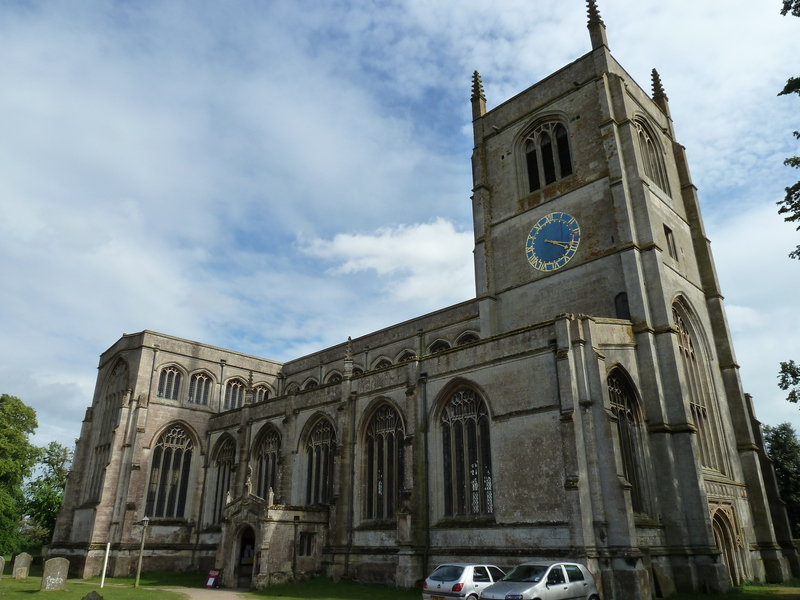 When I visited Lincolnshire earlier in the year I went to see the church of St Michael at Swaton. Having been warned that the church is kept locked and that a key holder needs to be located I approached the small village with trepidation. Friends had told tales of not being able to gain access and having to stand on upturned flower pots to peer in through the windows, but I managed to obtain the huge key from a lovely lady at the tearooms just down the road and having turned the locks – top and bottom – on the old wooden church door I stepped inside. St Michael’s dates back to the Normans. William the Conqueror gave Swaton to Wido de Credon, a King’s thane and it is thought that a church was built here soon afterwards. 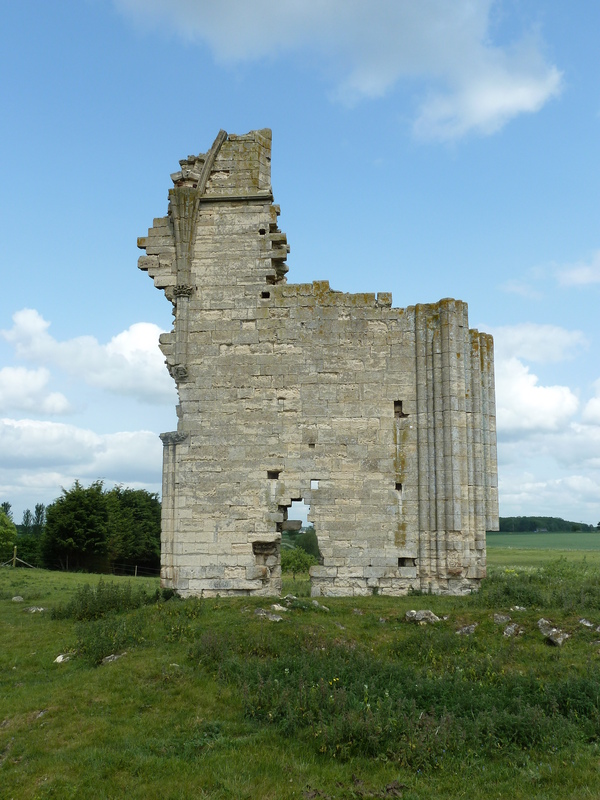 There was rebuilding in 1230, but it is the extensive alterations that were undertaken in 1320 that interest me most as the church was, at this time, in the possession of Alice de Lacy. 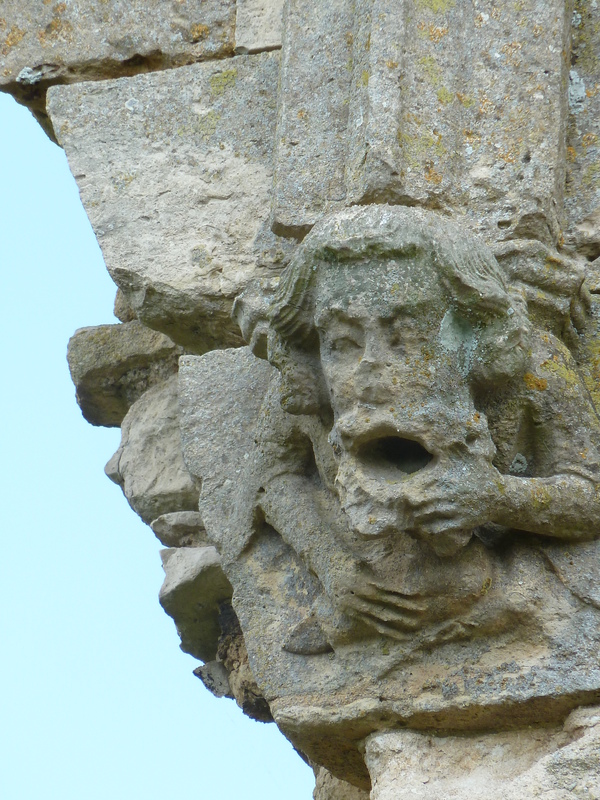 At the back of the church is an effigy of a lady. The wife of Gerard de Camville was Nicholaa de la Haye. She was the daughter of Richard de la Haye and Matilda de Verdun who had been given Swaton as a dowry by Henry II after it had passed back into royal possession. Nicolaa was the hereditary custodian of Lincoln Castle and after her husband’s death she became the constable in her own right and held the castle against a siege for King John. 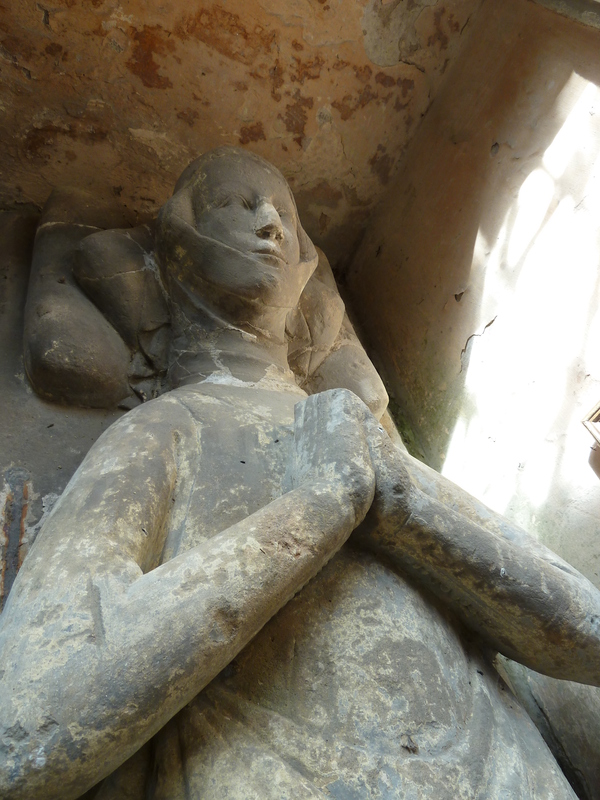 She was buried at Swaton Church so it seems reasonable to assume that the effigy is hers. But experts claim that the style of the effigy is from a later date. It shows a lady whose head is resting on a double cushion and up until around 1300 it was usual to have only a single cushion. Her feet rest upon a dog, which looks a little like a spaniel, and up until the beginning of the 14th century it was more usual for the feet to rest on a lion. The style of dress, with the tightly buttoned sleeves, which can be clearly seen, would also date the effigy to the early 1300s. It has been suggested that the effigy could be that of Nicolaa’s granddaughter, Idonea de Camville who married William Longspee (2), or her great granddaughter, Ela (or Emma) Longspee. into the king's hands. By K.
This Emma de Lungespeye was a cousin of Alice's mother. She would have been an elderly lady by this time and had no children so it is possible that when she died, possibly in 1331, her body was buried in her family's church and Alice commissioned an effigy. Or could the effigy be Alice herself? She was buried at Barlings Abbey in 1348. It isn’t known whether there was an effigy on her tomb there or who might have commissioned it although it was not unheard of for effigies to be commissioned by people in their own lifetimes. It is an outside possibility that Alice had the effigy carved during her lifetime and that it was intended for her own tomb. Perhaps it was rescued from the abbey church at the Dissolution and brought back to Swaton from Barlings? It seems unlikely. 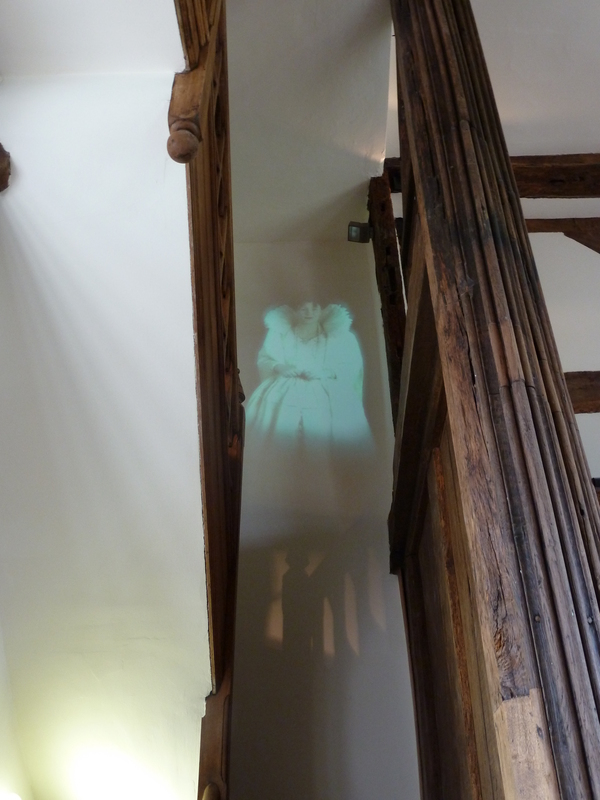 It is also unlikely that the effigy is of Alice’s mother Margaret Longspee (de Lacy). She was buried at Lacock Abbey which was founded by her ancestor Ela Longspee and although her tomb may have born an effigy it is very unlikely that this is it. Perhaps Alice commissioned an effigy of her ancestor Nicolaa de la Haye to be placed in the newly refurbished church to mark the site of her burial. That would explain the discrepancy between the date of Nicolaa’s death and the date of the carving. dated at York, 16 July, 16 Edward II, by Alice de Lacy, countess of Lincoln and Salisbury,to the abbot and convent of St. Mary’s, Barlinges, of the manor of Swaveton, co. Lincoln, and the advowson of the church thereof, with knights’ fees, homages and services of free tenants, free fair, free market, and free warren, for the good of the souls of Edward I and Eleanor his wife, Henry de Lacy, sometime earl of Lincoln, and Margaret his wife, her father and mother, Edmund her brother, her ancestors and heirs. 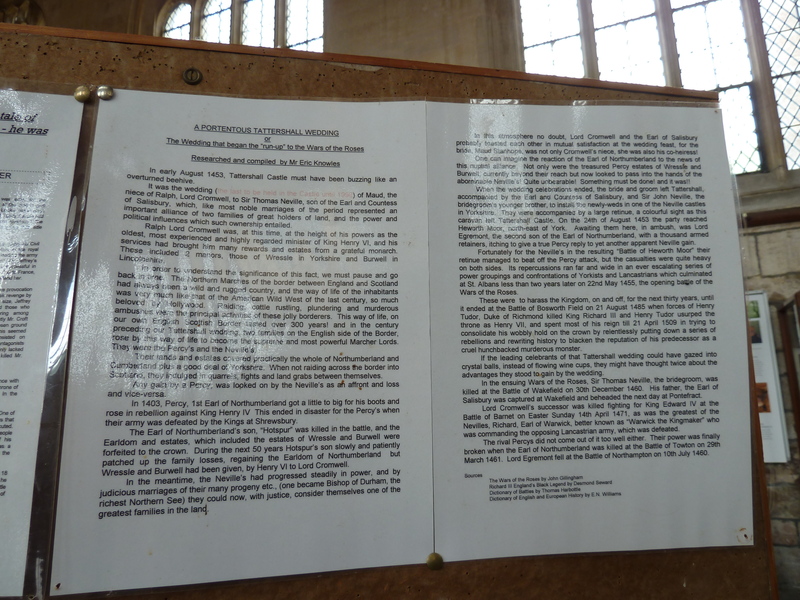 It seems that the church of St Michael was a special to Alice as a place that had been in the possession of her mother’s family for generations. I enjoyed seeing it for myself and if you’re in the area do take the trouble to locate a keyholder and go to look inside. 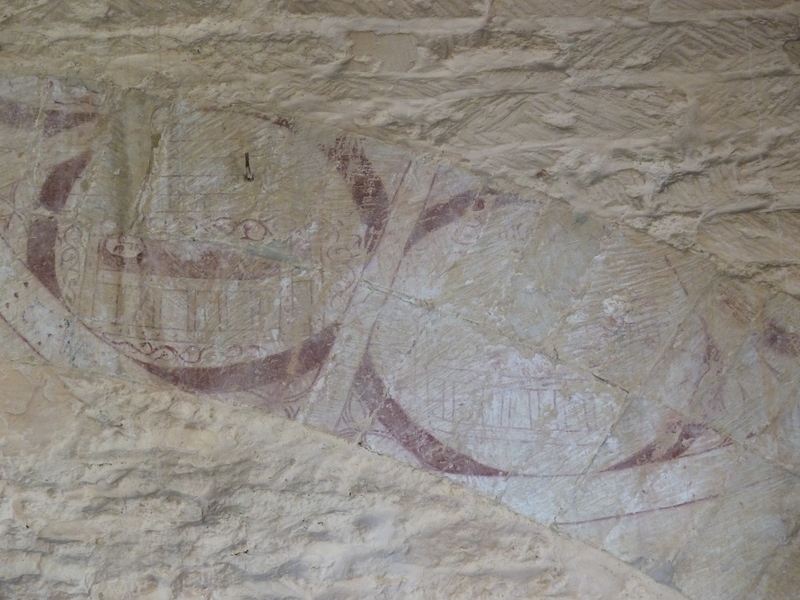 It’s well worth seeing and you will also find the remains of a medieval wall painting of the wheel of fortune – fortune that was not always kind to Alice de Lacy. 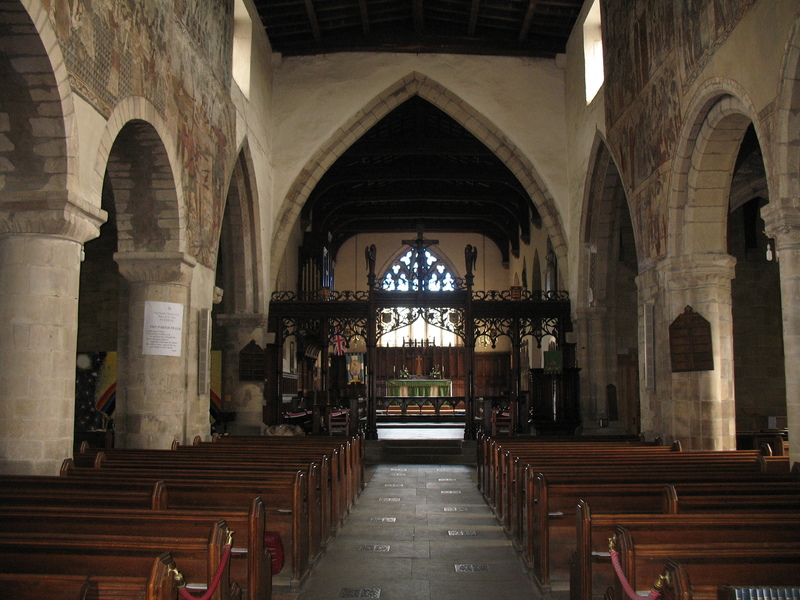 During my exploration of Lincolnshire I visited Holy Trinity church at Tattershall. 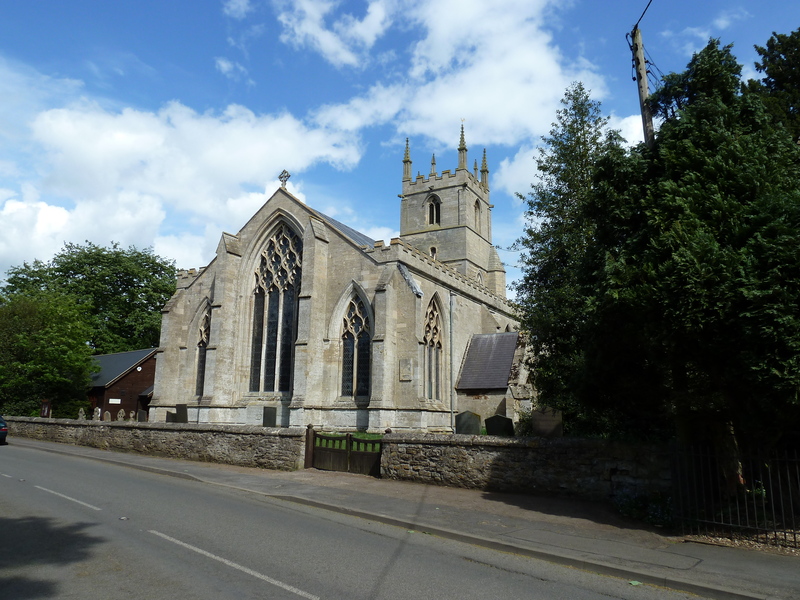 Having received a charter from Henry VI to demolish the old Norman church of St Peter and St Paul, Ralph, 3rd Baron Cromwell, began his new church in 1439. 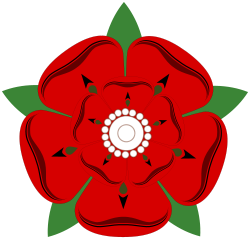 It was not until 1500 that it was completed and the intervening years saw the power struggle between the Yorkist and Lancastrian kings that is known as the Wars of the Roses. If you don’t want to read it all, or can’t make the text large enough it basically explains that this marriage led to bad feeling between the Nevilles and the Percys of Northumberland to the extent that there was a pitched battle at Heworth Moor in Yorkshire as Thomas Neville took his new bride home. The troubles, as was common in the middle ages, centred around land and in particular the manors of Wressle and Burwell which had once belonged to the Percys, but had been given to Lord Cromwell by Henry VI. It then goes on to explain a little about the roles of these families in the Wars of the Roses. Another interesting feature of the church is the tiny grave of ‘Tom Thumb’ a local resident who died in 1620. It is lovingly marked with flowers and a short poem in his honour. 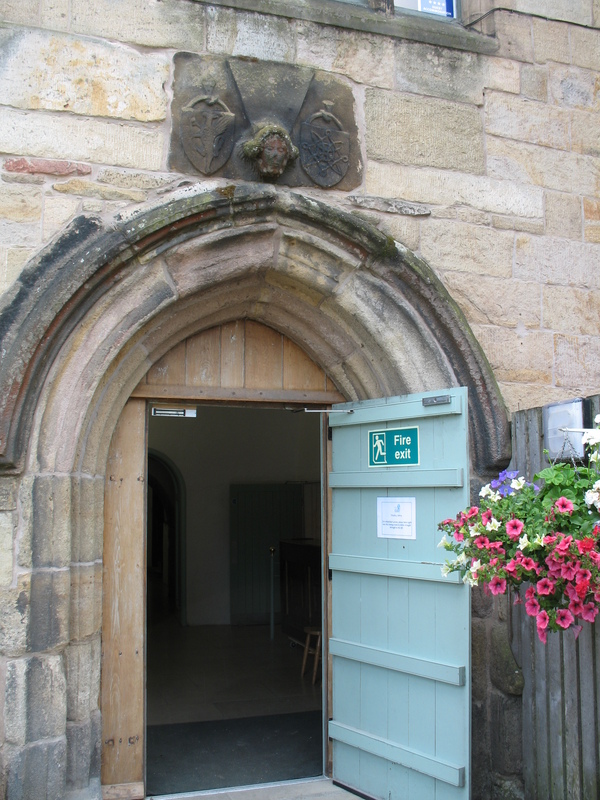 The church also has a small tea room at the back of the nave, where drinks and home made cakes are served and is worth a visit for that alone. Ralph, 3rd Baron Cromwell, also demolished his ancestors nearby stone castle to make way for a new brick built one which was also constructed during the 1440s. The whole area must have been one vast building site during those years. But as Lord Treasurer to Henry VI he certainly had the resources to show off his wealth and status. The remains of Barlings Abbey lie at Low Barlings about seven miles from Lincoln. The abbey was built around 1154 by monks (known as canons) of the Premonstratensian order, on land given to them by Ralf de Haya. It’s thought that they first settled on higher ground at Barlings Grange, but then moved to this site known as Oxeney – the island where the oxen graze. The canons built a causeway of about half a mile to cross the fen and link the abbey to higher ground and it still forms the foundation of the narrow lane which twists through the fields to the site of the remains. The land is privately owned but access is allowed. Follow the footpath through the gate and you will see the remains of one side of the nave rising to the skyline. All around you will see grass covered mounds where other stonework peeps out from under the grass, giving clues to the once magnificent abbey church that stood here. Not far from here Alice de Lacy is buried alongside her second husband Eble le Strange. Alice’s links with the abbey go back to its foundation. She is a descendant of Ralph de Haya through her mother Margaret. Both Alice and her mother are also descended from Nicola de la Haye, famously known as a constable of Lincoln Castle who defended it against a siege in the reign of King John. Nicola is buried at the church of St Michael at Swaton and when Alice’s lands were forcibly taken from her after the execution of her first husband Thomas, earl of Lancaster, she pleaded to be allowed to endow the manor and church of Swaton to Barlings Abbey for prayers for her soul and the souls of her parents and ancestors. Agriculture, and particularly wool production, made Barlings Abbey one of the richest and most influential of the Premonstratensian houses in England. The canons wore a white habit and cap and were known as the white canons. Unlike ordinary monks, they did not always stay within the cloisters of the abbey, but served as village priests and missionaries in the local community. Edward III, lodged at Barlings on at least three occasions and his chaplain was a canon of Barlings and later its abbot. The last abbot was Michael Mackarel. At Henry VIII’s dissolution of the monasteries he was charged with treason after being accused of involvement with the Lincolnshire Rising. 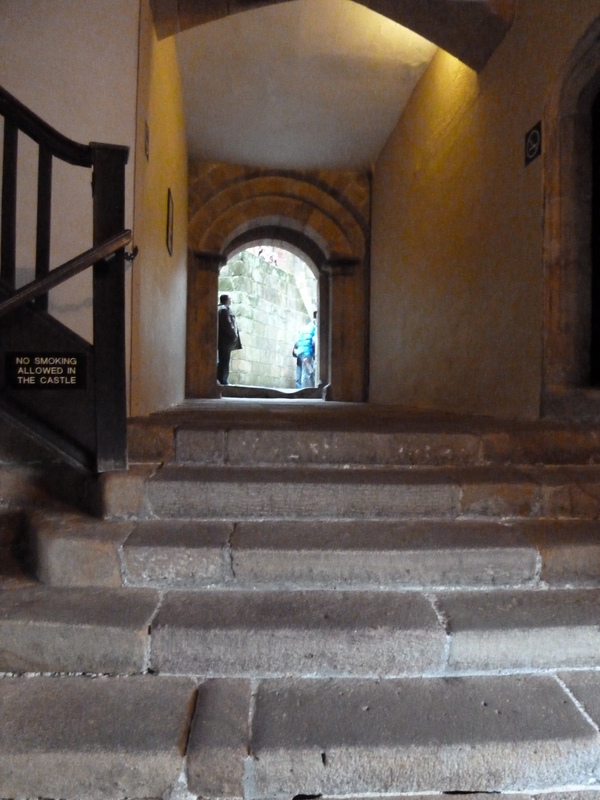 He was imprisoned in Lincoln Castle and later taken to the Tower of London where he was hanged in March 1537. 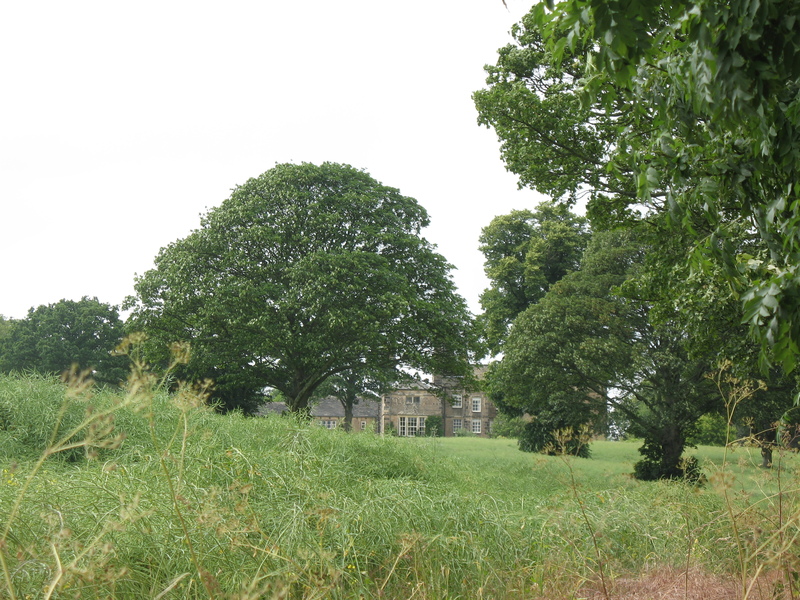 The house at Low Barlings, complete with holiday cottages, stable block, 7.7 acres of land and the site of the abbey is currently for sale. So if you have some spare cash and you’d like to own this historic site, it can be yours for £650,000. If I had that sort of money I might just be tempted. http://www.primelocation.com/uk-property-for-sale/details/id/rbln6964301/ One of the photographs on the site is taken from the air and gives a different perspective of the abbey ruins. 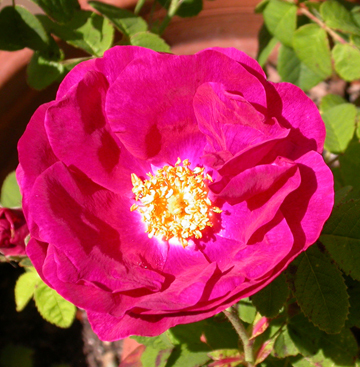 The primrose or prima rosa is the first rose of the year. It is also known as a primula and has about 1000 varieties. 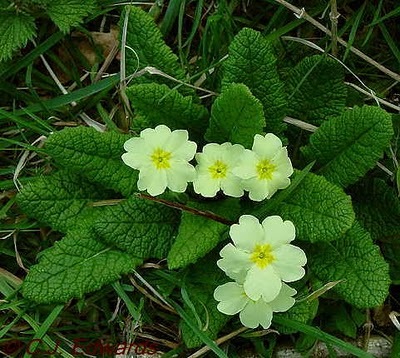 The best known is the common primrose, the bright yellow flower that not only grows in our gardens, but can be found in woodlands, hedgerows and shady meadows. 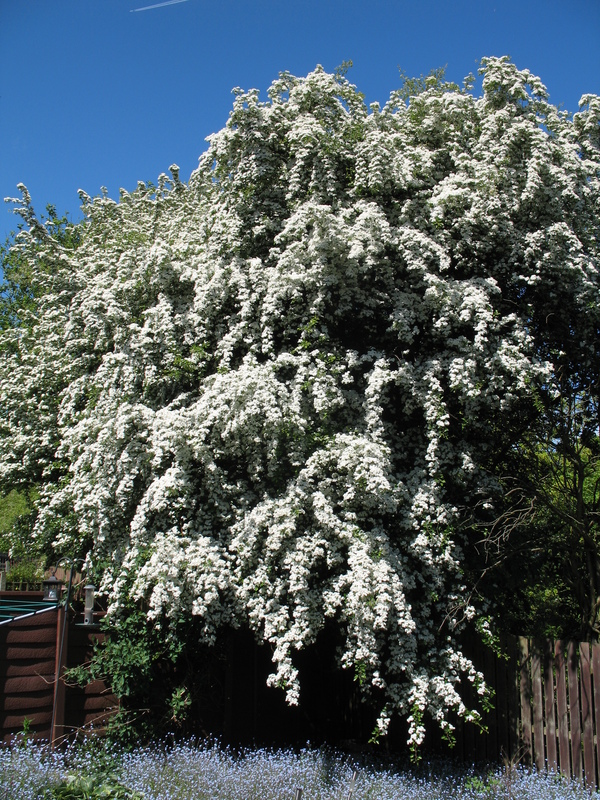 It grows up to 20 cms high and has oval tapering leaves which form a rosette. The solitary yellow flowers are borne on long hairy stalks and usually appear from February until May. The primrose was supposedly the favourite flower of Benjamin Disraeli who was Prime Minister to Queen Victoria in 1868 and again from 1874 to 1880. Queen Victoria sent a wreath of primroses to Disraeli’s funeral saying that they were ‘his favourite flowers’. But it seems that she may have been referring to Prince Albert. However, in following years, on this day, people wore primroses in remembrance of Disraeli and the date became known as Primrose Day. Disraeli is remembered for his reform of housing and working conditions, his purchase of a controlling interest in the Suez Canal and for being laughed at when he made his maiden speech to Parliament. In 1876 he created the title of ‘Empress of India’ for the Queen and she made him Earl of Beaconsfield in the same year. He was also a novelist and started to write in an attempt to pay off debts incurred by losses in stocks and shares. He is often remembered too for being born a Jew, although he converted to Christianity at the age of thirteen after his father had a row with the synagogue. In 1883 a statue of Disraeli by Mario Raggi was unveiled in Parliament Square, London and in following years it was festooned on the anniversary of his death with primroses. The following extract is from an old newspaper dated 1927. The artist James George Bingley who lived from 1841 to 1920 painted a watercolour called “Primrose Day”. Another painting, this time in oils, was by Ralph Todd and is entitled “Primrose Day 1885”. 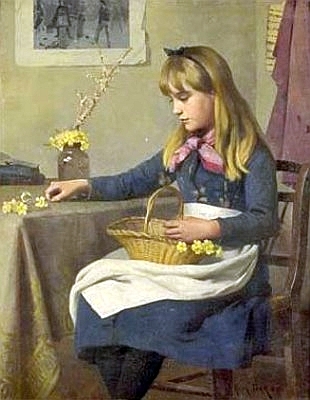 It shows a young girl in a blue dress and white apron with a basket of yellow primroses on her knee. Beside her on a table are more primroses and yellow primroses are displayed in a glass jar. Perhaps it is the political associations that have caused it to decline in this country, but I think it would be nice to wear and display primroses on one special day, just because they are so beautiful and such a firm statement of springtime. Can you spot the de Lacy lion? I made the most of the warm sunny weather this week to replace some of the photos that I lost in ‘the great computer crash’. 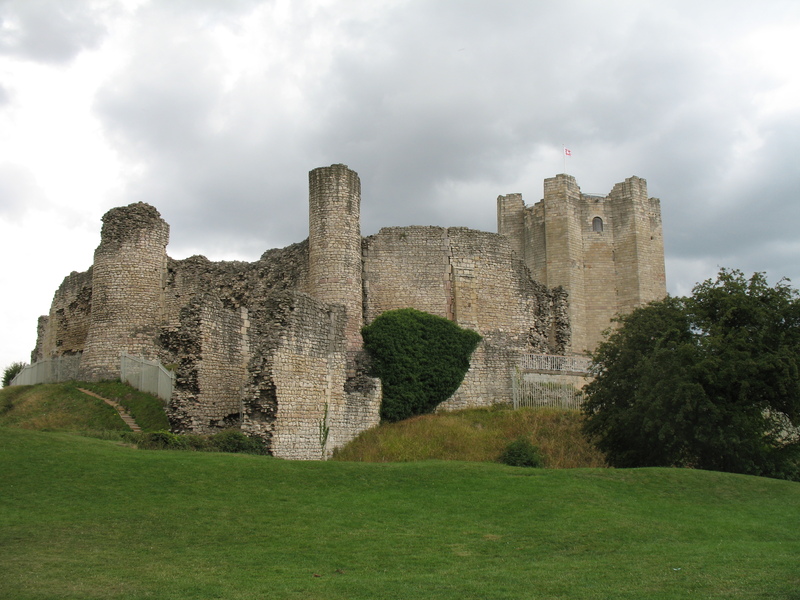 Two of the places I visited have huge connections with the de Lacy family – Pontefract Castle built by Ilbert de Lacy and Whalley Abbey which was founded by Henry de Lacy. 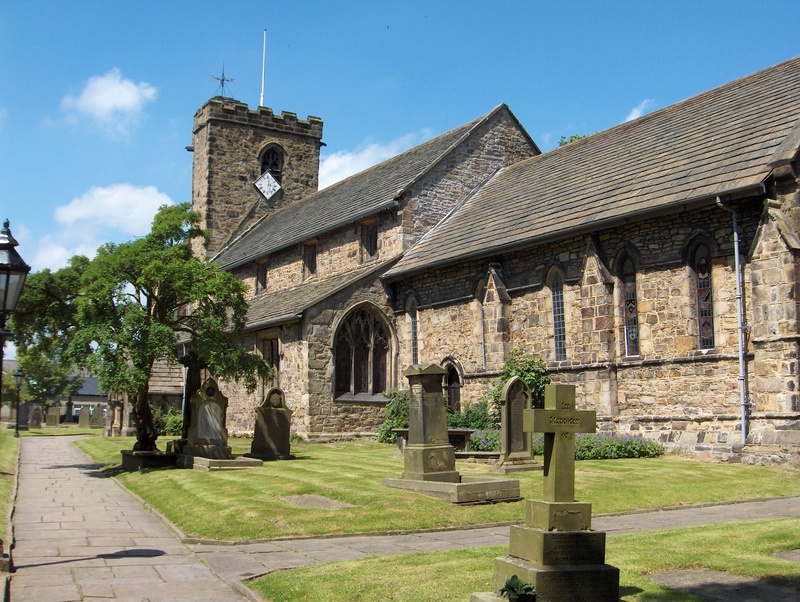 When Henry de Lacy gave permission for the monks at Stanlaw Abbey to move to Whalley one of the stipulations he made was the remains of his father, grandfather and great grandfather should be brought with them and reburied in the new abbey church. Sadly there is no record of this happening, but I believe that it did as there is the remains of a large gravestone to the left of the altar in what would have been the chancel of the church that bears the de Lacy lion. You can see it on the first photo. 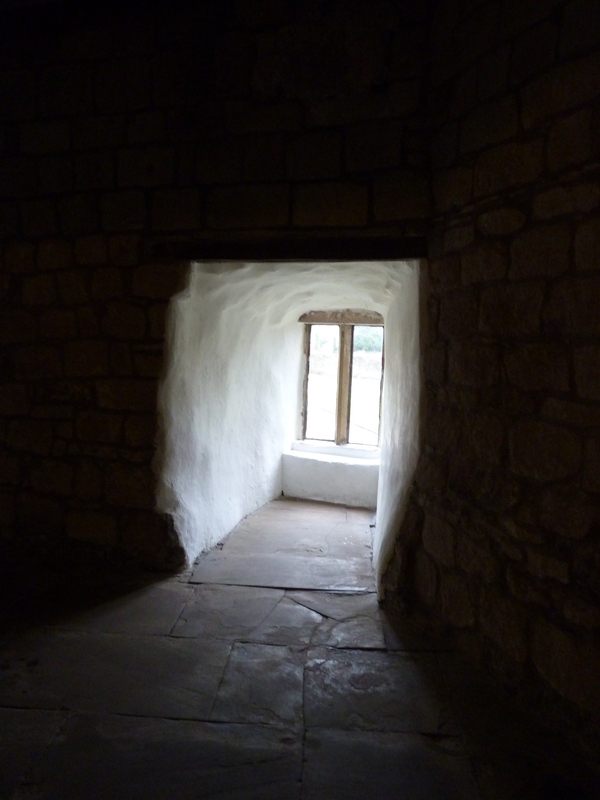 The second photo is one that I took at Pontefract Castle. 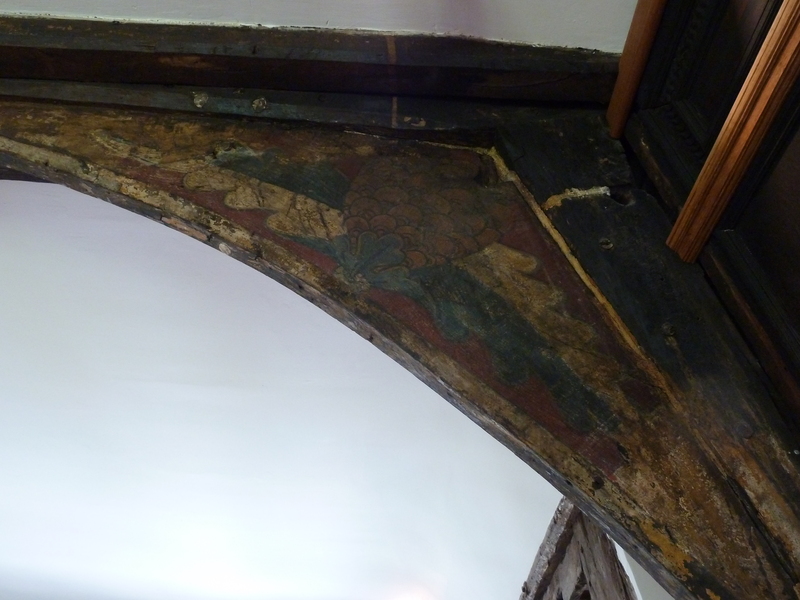 It is very worn but I think I can make out the outline of the de Lacy lion there as well. What do you think? Can anyone else see it? Click on the pictures to enlarge them. Someone left a poor review of The de Lacy Inheritance on the Waterstone’s website complaining that the distances and travelling times in the story were confused. So, just in case anyone thought I’d simply made them up, I’ll share an extract from Dr T.D. Whitaker’s History of the Original Parish of Whalley, and Honor of Clitheroe (Volume IV, chapter III). He says that the estates of the de Lacy family stretched from Pontefract in Yorkshire to the Trough of Bowland in Lancashire. He calculates that a journey from one side to the other, on horseback, would have taken at least three days. The first stage would have been from Pontefract to Rothwell. The second stage from Rothwell to Bradford, then over the moors to Luddenden, on to Cliviger and to their manor at Ightenhill (on the outskirts of what is now Burnley). The third stage would have taken them from here to the castle at Clitheroe. He gives the distance travelled as around 90 miles, which would mean a distance of 30 miles a day, which at a speed of 3 miles an hour would have meant 10 hours in the saddle each day – so the journey would not have been leisurely. Neither would it have been possible to travel so far each day in winter, as the travelling would be restricted by the hours of daylight. On Google maps a similar route from Pontefract to Bradford then over the moors from Keighley to Colne and on to Clitheroe via Burnley is 70 miles and would take two hours by car. But one feature I find useful when calculating medieval travelling times is the estimate of how long it would take the walk the route. This shows as 21 hours. So maybe three days, at seven hours a day, is not so far out after all. 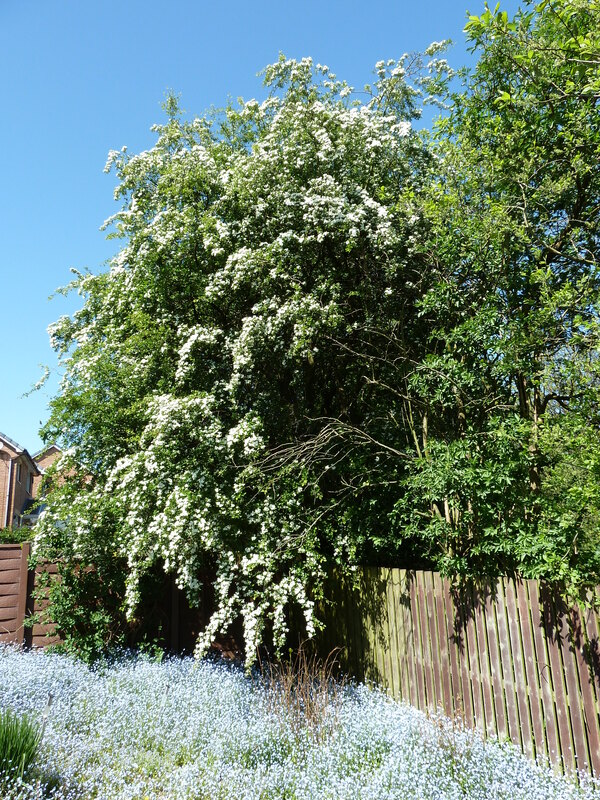 But given the hilliness of the route over the moors and the need to stop for food and some respite I think that it is probably too optimistic and that it’s more likely to have taken four or five days to cross the Pennine hills from Pontefract to Clitheroe. 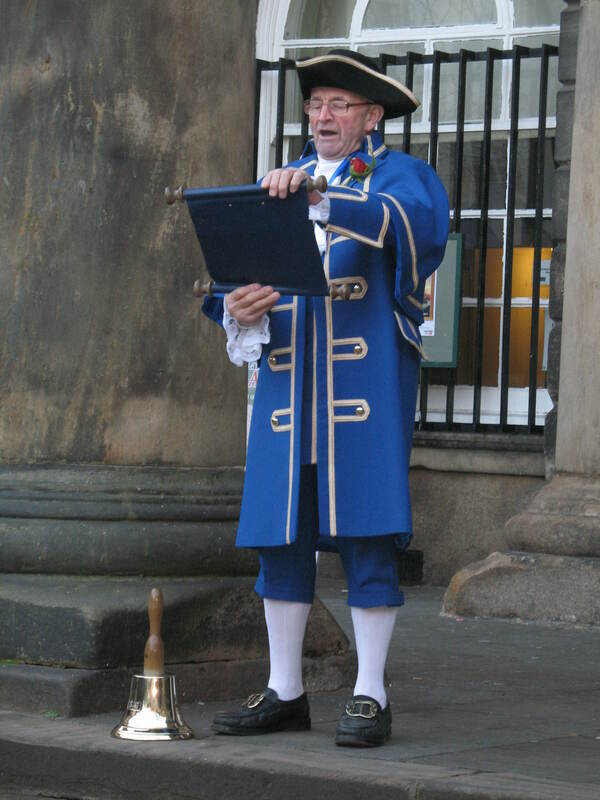 Today is Plough Monday – the first Monday after the feast of the Epiphany (6th January). The origins of the day are not clear but one possibility is that it was the first day when the peasants returned to work after the Christmas holiday. Medieval peasants did not own land but were given an area of land to farm in return for working two or three days a week farming their lord’s land. During the twelve days of Christmas they were given a holiday from working their lord’s lands, but once Epiphany had passed the lord would want his land ploughed ready for the spring seed to be sown and so all his serfs would be obliged to turn up with their ploughs and do just that. At this time it was usual for a light to kept burning in the local church before the image of a saint that was known as the plough light. This was probably a semi-Christian ritual to ensure a good harvest. The first practice of going around the village with a plough on this day and begging for money was to ensure that there was enough to pay to keep the plough light burning throughout the year. The Reformation put an end to plough lights, but the tradition continued although in a slightly different form. On the day before Plough Monday, sometimes called Plough Sunday, the ploughs were taken to the local church to be blessed. On the Monday the decorated ploughs were paraded through the streets by ploughmen dressed in their clean white shirts with the sleeves decorated by brightly coloured ribbons. They would call out for ‘a penny for the ploughboys!’ from the local landowners and to prevent themselves being recognised there began a tradition of the ploughboys blackening their faces. They were usually accompanied by an old woman – or a boy dressed up as an old woman – called the Bessy and there was often also a fool, dressed in skins complete with a tail whose job it was to collect the money. Anyone who refused to pay up would have a furrow ploughed outside their home. One record from 1597 tells of a court case in which ten men from the village of North Muskham in Nottinghamshire were ordered to turn back the furrow they had ploughed across the churchyard on ‘Plow Daie’! The money was intended to be given to the poor, though from some accounts that did not always happen as the event became associated with rowdiness and drinking and damage to property. It become less popular as industry took the place of farming though it was still marked in many places and by the 19th century it had become associated with straw bears – men or boys clothed in a layer of straw who danced to encourage the crops to grow in the spring. Although not widely celebrated today the tradition does live on and in some places has been revived as folk dancing event. Many of you will already know that Henry de Lacy gave land at Whalley for the Cistercian monks to build a new abbey because the site at Stanlaw had proved unsuitable and liable to flooding. After Henry de Lacy’s death his lands passed to his son-in-law Thomas of Lancaster and after Thomas’s execution, for his rebellion against Edward II, to his younger brother Henry. 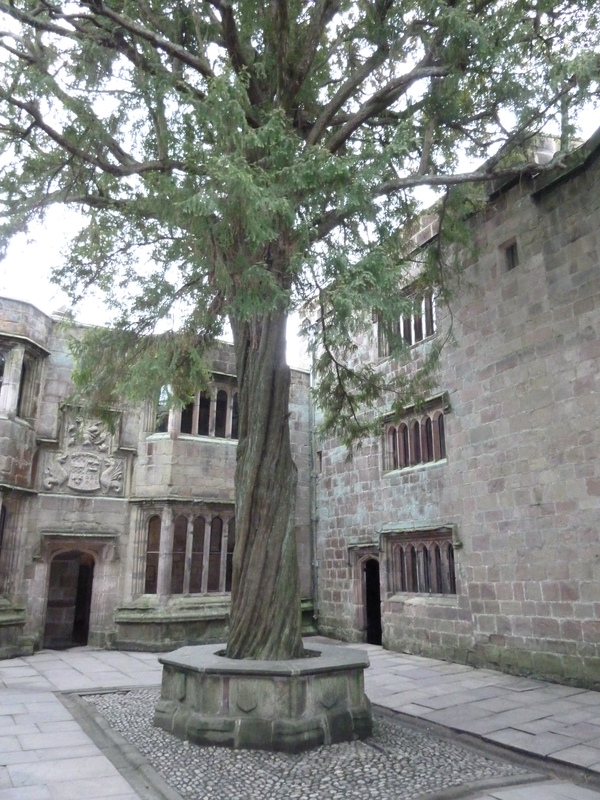 In December 1360 Henry Duke of Lancaster gave land at Ramsgreave and Standen for the maintenance of a recluse or anchoress to live in a hermitage in the churchyard at Whalley. 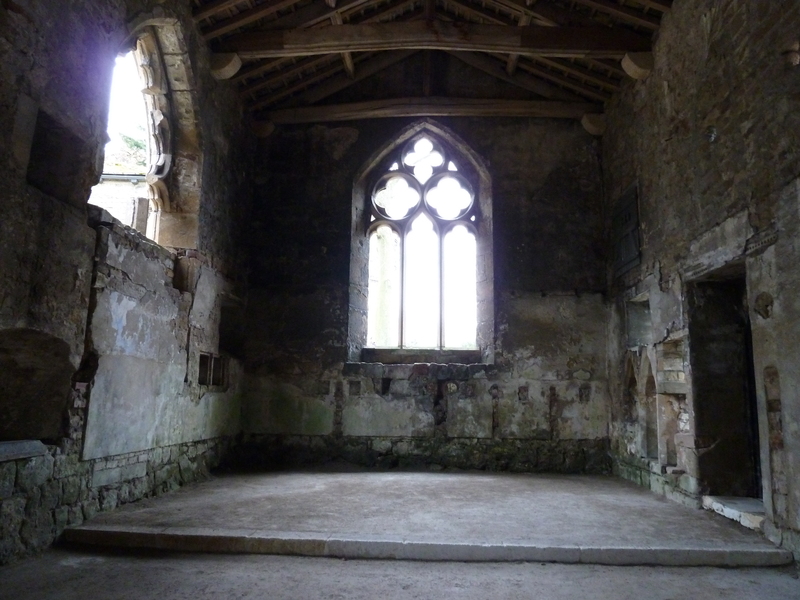 The recluse was to have two servants to wait on her, and a monk attended by a server was to sing mass daily in the chapel of her inclosure, the abbey providing all necessaries. These ‘necessaries’ were a weekly provision of 17 conventual loaves and 7 others, 8 gallons of the best ale, also 3d. for the attendants; and yearly: 10 stockfish, a bushel of oatmeal, a bushel of rye, 2 gallons of oil for the lamps, a stone of tallow for candles, 6 loads of turf and 1 of faggots. To THE KTNG OWRE SOVEREIGN LORD, &c.
Be hit remembryd that the plase arid habitacion of the seid recluse is within place halowed, and nere to the gate of the seyd monastre, and that the weemen that have been attendyng and acquayntyd to the seyd recluse have recorse dailly into the seyd monastre, for the livere of brede, ale, kychin, and other thyngs for the sustentacyon of the seyd recluse accordyng to the composityon endentyd above rehersyd : the whyche is not accordyng (fitting) to be had withyn such religyous plases. And how that dyvers that been anchores and recluses in the seyd plase aforetyme, contrary to theyre own oth and professyon, have brokyn owte of the seyd plase, wherin they were reclusyd, and departyd therfrom wythout eny reconsilyatyon. And in especyal how that now Isold of Heton that was last recluysd in the seyd plase, at denomynatyon and preferment of owre Sovereign Lord and Kyng that nowe is, is broken owte of the seyd plase, and hath departyd therfrom contrary to her own oth and professyon, not willyng nor entendyng to be restoryd agayn, and so livyng at her own liberte by this two yere and more, like as she had never bin professyd. And that divers of the wymen that have been servants ther and attendyng to the recluses afortym have byn misgovernyd, and gotten with chyld withyn the seyd plase halowyd, to the grete displeasaunce of hurt and disclander of the abbeye aforeseyd, &c.
Please hyt your Highness of our espesyal grase to grant to your orators the abbat, &c.
The result was that the hermitage was abandoned and it was ordered that the endowment should be used to maintain two chantry priests to say mass daily for the soul of Duke Henry and for the king. It seems that some cottages were later built on the site, but demolished in the 1800s and apart from the hermitage being located in the east of the churchyard there’s no clear evidence of exactly where it was – perhaps somewhere near to the present primary school? 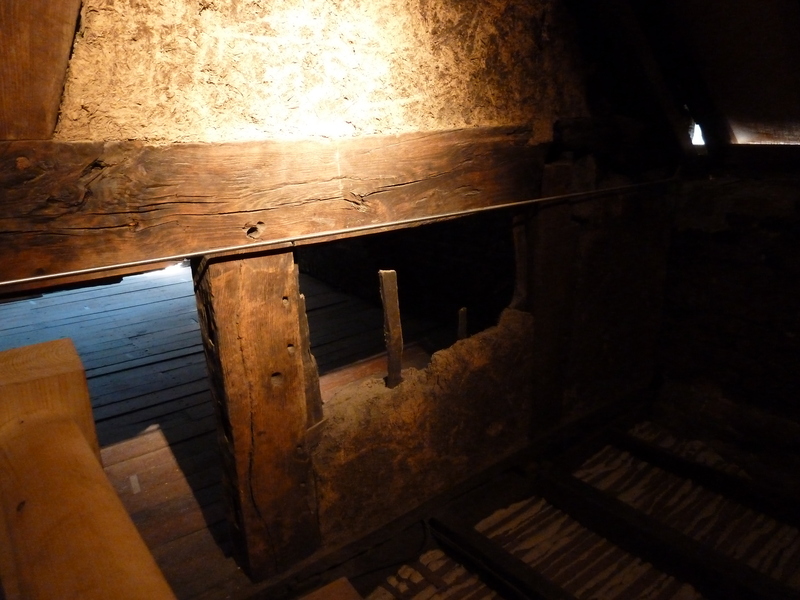 The plaque here records that the cell would have been blocked up after the anchorite entered and that she would have remained there for the rest of her life. ‘A small window admitted food and light and gave a view of the church’s altar’. Not much chance of running away from there then! Robert Curthose. The name was vaguely familiar. During my ongoing research into the de Lacy family I read that they were his supporters so when I saw a book named Conqueror’s Son – Duke Robert Curthose, Thwarted King by Katherine Lack I bought it and read it with interest. This well researched book tells the story of Robert Curthose, the eldest son of William the Conqueror who was beaten to the English throne by not one, but both, of his wily younger brothers. And to give legitimacy to the claims of first William Rufus and then Henry I, the reputation of their brother was recorded by chroniclers as that of a lazy and incompetent man. But then the victors always record their own version of history, don’t they? 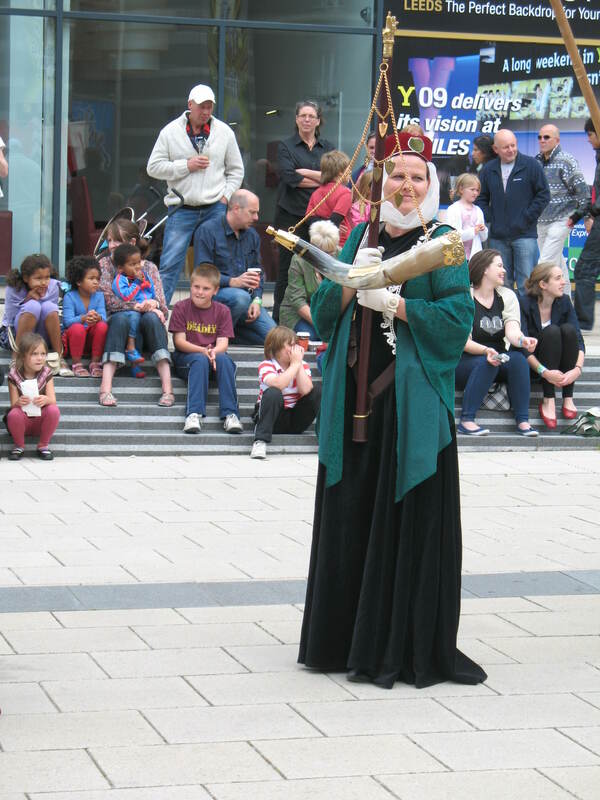 And along with kings such as Edward II and Richard III, Robert Curthose appears to have been done an injustice. As William the Conqueror lay dying in 1087, his second son William Rufus left him to his fate and sailed across the English Channel to have himself crowned king of England before his elder brother could do anything about it. Robert Curthose became Duke of Normandy and there were those who said that this division of his kingdom was what his father had planned, but if it had been pre-arranged why didn’t William Rufus wait until his father was dead and buried before leaving? I definitely smell a rat. Having lost England, Robert Curthose was one of the leaders of the First Crusade to reclaim Jerusalem. This was a huge undertaking. Thousands of people went – men, women and children. Robert Curthose proved himself a skilled military leader and returned in triumph three years later with a beautiful young bride. Except that just before he got back his eldest brother William Rufus was mysteriously shot in a hunting accident. He died and Robert Curthose’s youngest brother Henry had himself crowned king of England the very next day. I smell another rat. Robert Curthose did lead an invasion of England but was persuaded to come to an agreement with Henry. Robert returned to Normandy, but Henry wanted that as well and breaking his promise he invaded. He beat Robert in battle, took him prisoner and kept him captive in Cardiff Castle for the rest of his life. 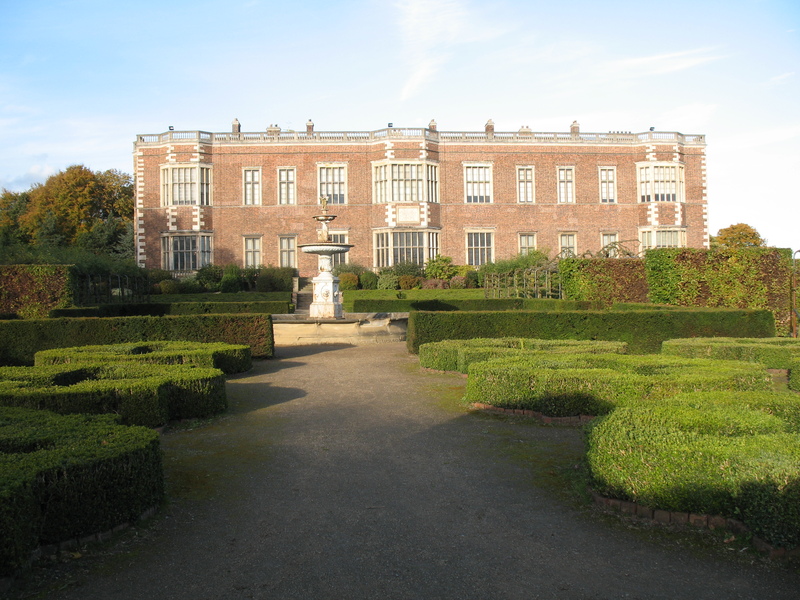 The de Lacy family lost their lands during this time and only had them restored after Henry’s death. Although the book doesn’t mention the de Lacy family other sources put Robert de Lacy and his son Ilbert at the centre of these struggles, which make more sense to me now that I’ve read more about the history. It’s a story well worth telling and one that I plan to pursue in the future. 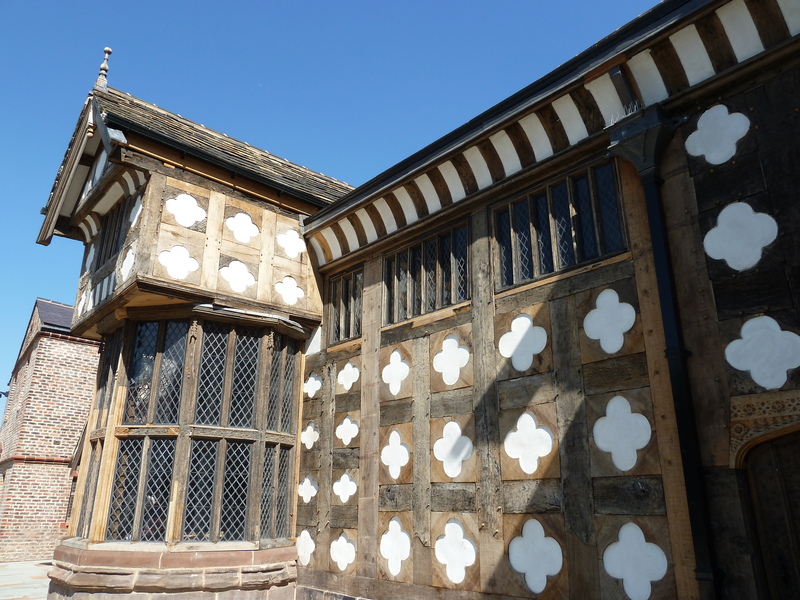 The abbot then handed over the keys to his abbey to Henry VIII’s commissioners and retired to live in the gatehouse. In the eighteenth and nineteenth centuries the main road to Leeds ran through the nave of the church. 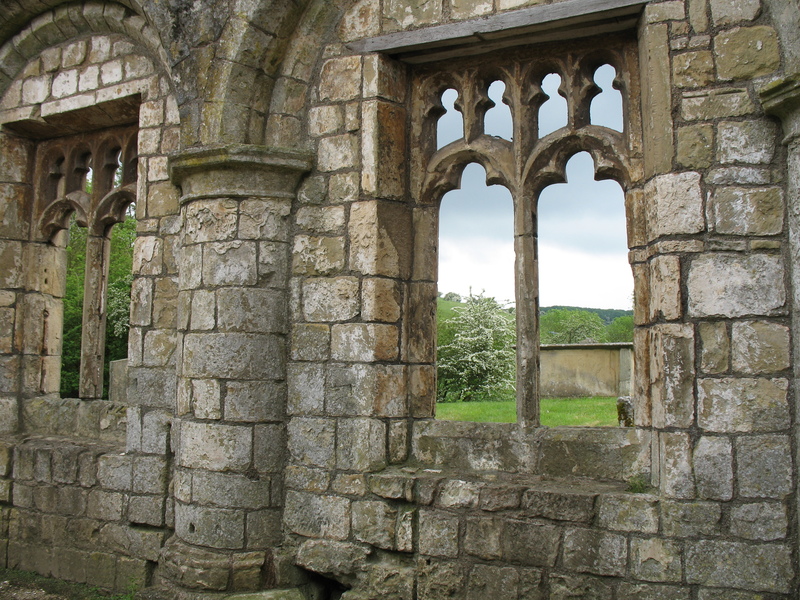 The base of the east window was destroyed and where monks had once sung and prayed and where benefactors were buried, travellers walked past or rode on horseback or rolled by in laden carts. 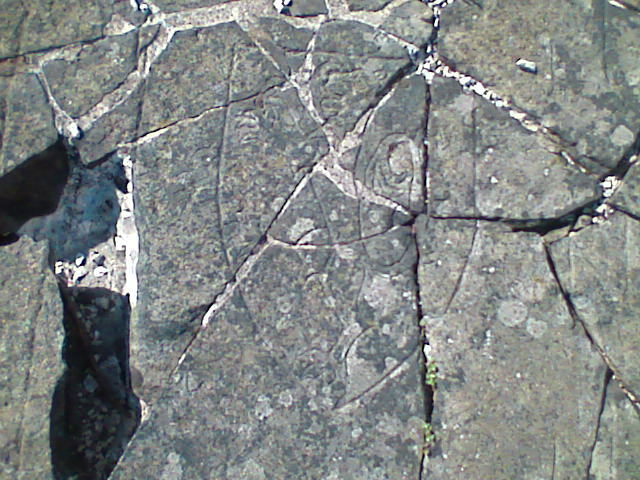 Many scratched their initials into the stone pillars as they passed by. In 1827 the road was redirected, but today the A65 still runs through the grounds of the abbey and you have to negotiate two pelican crossings to walk from the gatehouse to the church. 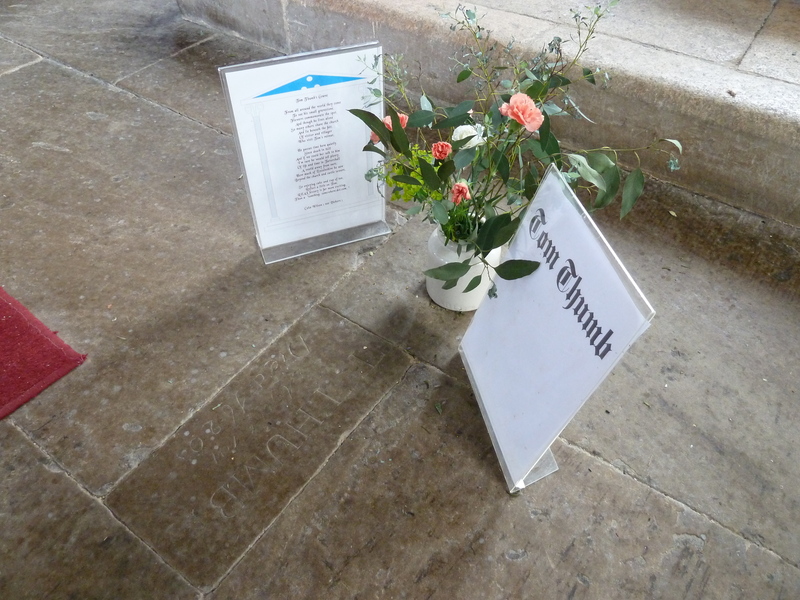 The base of east window was rebuilt in Victorian times and now a flagged path runs the length of the church for visitors to walk and for groups of schoolchildren to measure the length of the nave with a click wheel. High above jackdaws squawk and drop their feathers (and worse) but in one of the chapels there are still original tiles and if you close your eyes very tightly you may be able to imagine just how Abbot Ripley and his monks felt as they filed out of their church for the very last time. 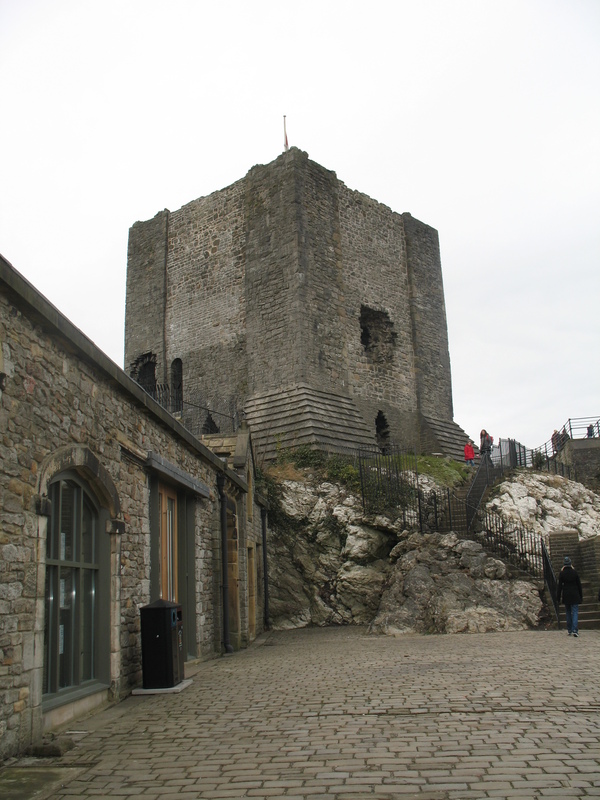 So who really built the castle at Clitheroe? It has become commonly accepted that the castle at Clitheroe was built by the second Robert de Lacy in 1186, but there is compelling evidence that it was, in fact, built by the first Robert de Lacy before 1114, which would make it over 70 years older. The first Robert was the son of Ilbert de Lacy who was given lands that became known as the honour of Pontefract after the Norman conquest of 1066. Robert inherited these from his father and was also given lands in Blackburnshire which included the honour of Clitheroe. He succeeded his father some time between 1091 and 1100. However Robert was banished from England in 1114 by Henry I (presumably for disputing his right to seize the throne from his elder brother who was away on Crusade) and the de Lacy lands were given to Hugh de Laval. 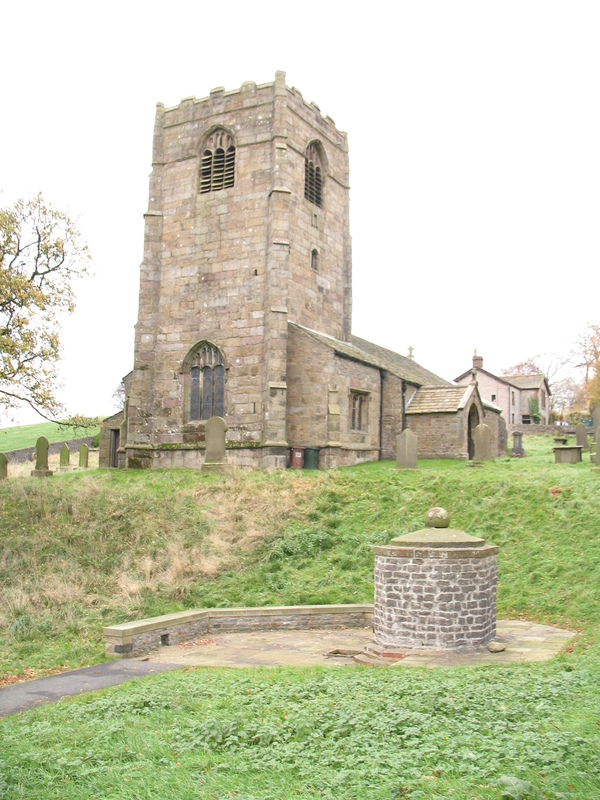 Hugh confirmed a charter that gave income to the Cluniac priory of St John at Pontefract that had been founded by the de Lacys, and in it he refers to the chapel and tithes of his demesne of the castle of Clitheroe: ‘capellam Sci. 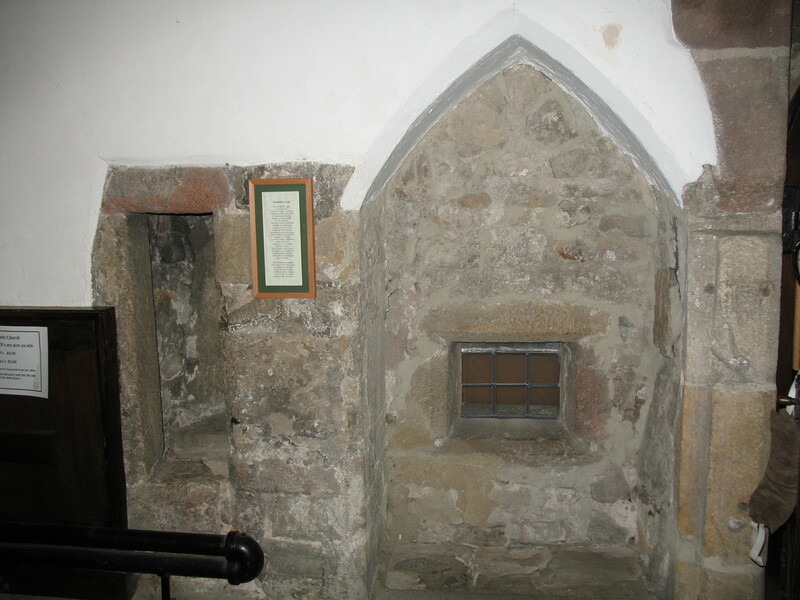 Michaelis in Castro de Clyderhow’ – the chapel of St Michael in the castle at Clitheroe. This was confirmed by Robert de Lacy on his return. And as Thomas Dunham Whitaker points out in his history ‘Lords of the Honour of Clitheroe’, it seems unlikely that the land would have been owned for over two generations without a castle being built to administer the estates. There is also evidence for a much earlier castle being built soon after the conquest when the lands at Clitheroe belonged to Roger de Poitou. In the Domesday Book it is recorded ‘Berenger de Todeni had held XII car. of land in that place, sed modo est in Castellatu Rog. Pictaviensis’. This would seem to indicate that Roger de Poitou had built a castle. It may have been a wooden structure as most of the early Norman castles were. 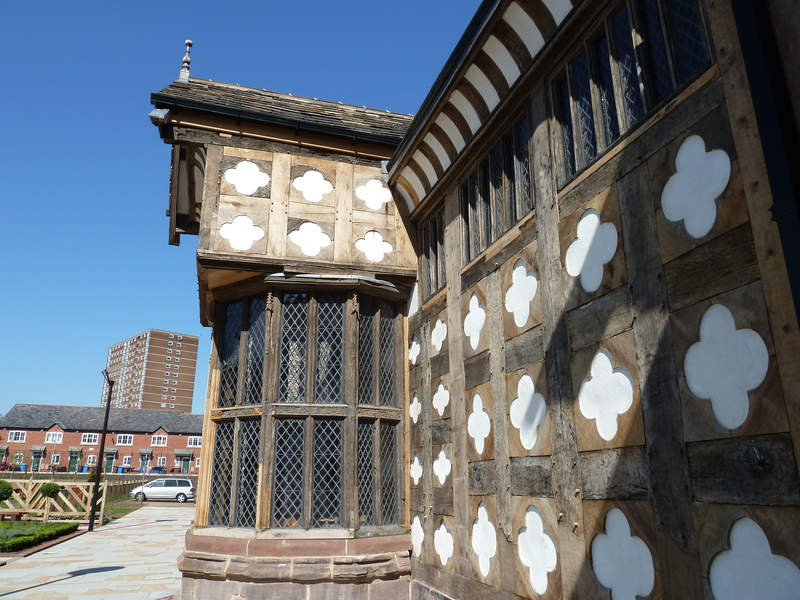 If it was originally wooden then it was replaced by a stone building at a later date. But whether it was replaced by the first Robert de Lacy before 1114 or by the second Robert de Lacy in 1186 remains open to speculation. The main evidence for the castle being built by Robert de Lacy II comes from a document called Historia Laceiorum. This was written in the 15th century and was printed by Sir William Dugdale in his Monasticon Anglicanum – a history of all the abbeys and other monasteries in England, written in Latin. (Which isn’t helpful as I have to rely on translations). Dugdale linked this document to Kirkstall Abbey though there is no conclusive evidence that it was written there and other historians link it to Whalley Abbey as most of its information is regarding the Lacy lands to the west of the Pennines. The Historia does contain some known errors. For example Aubrey (or Albreda) Lisours is confused with her daughter of the same name and it misdates the death of Edmund de Lacy. So, although the document credits Robert de Lacy II with the building of the castle at Clitheroe, it could be an error and the writer, working many hundreds of years after the events, could have confused the two Roberts. Whichever of the two Roberts built the castle they seem to have done a good job. The keep still stands in fairly good repair despite the wear and tear of time and Oliver Cromwell, on whose orders so many castles were pulled down so that they could not be used as strongholds against him. 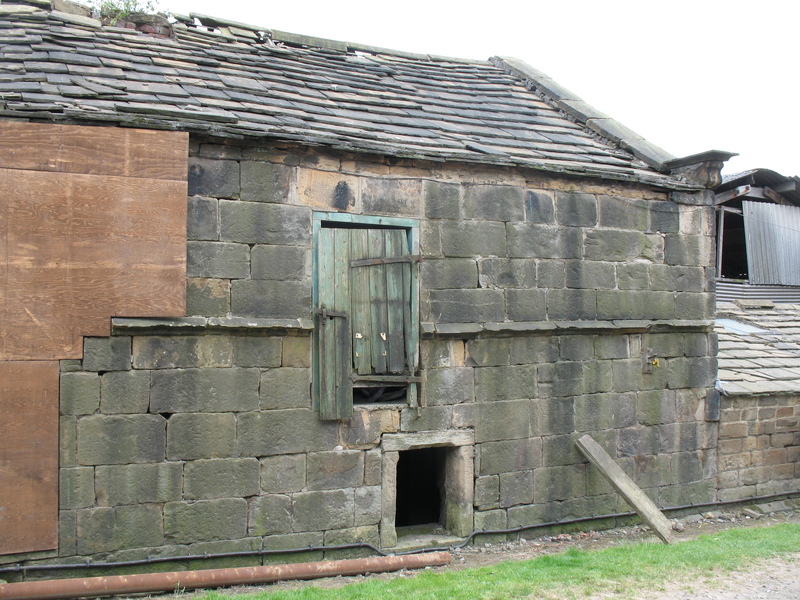 Apart from one gaping hole, blamed on the devil throwing a boulder from Pendle Hill, the remains are currently in good repair and could stand for hundreds of years more. This seems to confirm that Roger de Lacy had a brother named Richard who died of leprosy and was buried under the chapter house at Norton. When the priory was excavated a burial was uncovered in the chapter house and the skeleton showed signs of Paget’s disease. 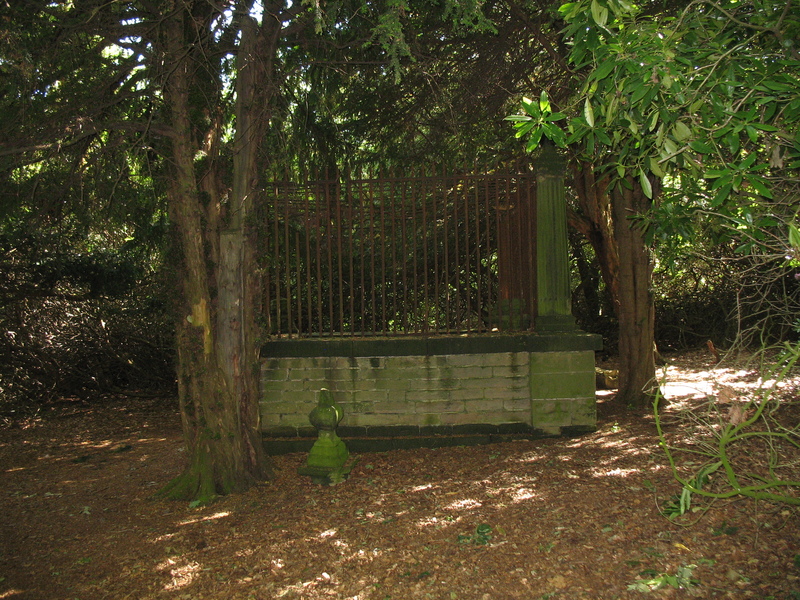 The only other member of the de Lacy family known to have been buried at Norton Priory is Alice, the daughter of Peter de Aquila, who was the first wife of John de Lacy. 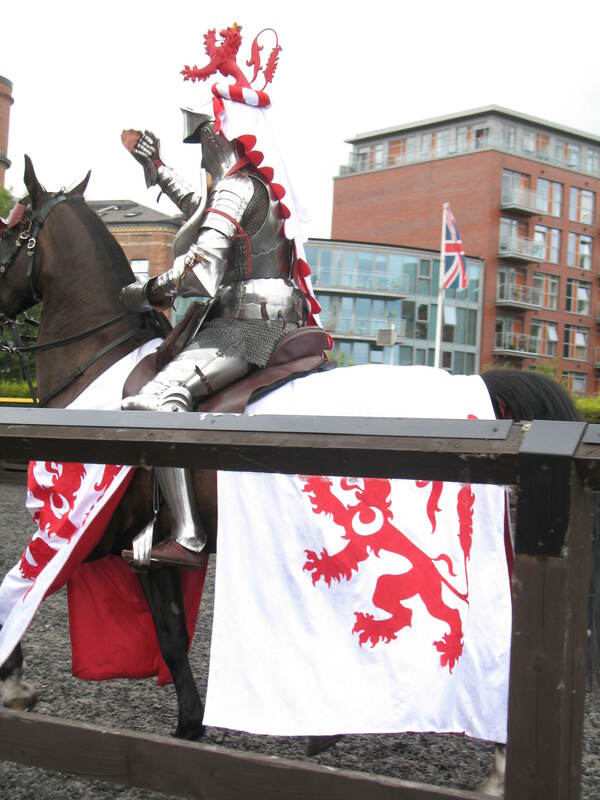 I went to watch the final of this joust at Leeds Armouries today. It was brilliant – very competitive – with lots of galloping horses and splintering lances as the competitors jousted for this beautiful trophy. The winner of the trophy was Graham Turner, perhaps better know for his medieval artwork. 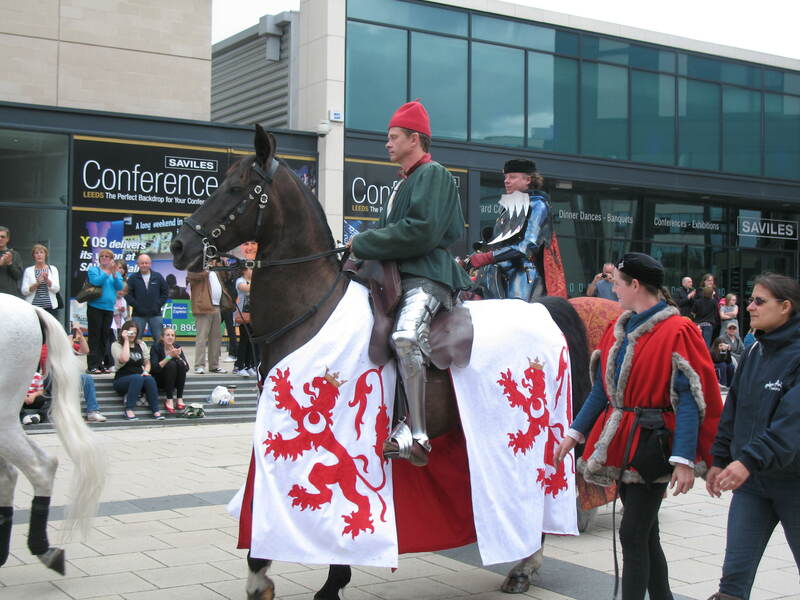 Here’s Graham in the pre-joust parade and in his armour. Yesterday I went to visit the village of Ripley, near Harrogate, in north Yorkshire. The village is dominated by Ripley Castle which has been the home of the Ingilby family for the last 700 years. One of the earliest members of the family, Thomas Ingilby, was knighted by Edward III after saving him from an attack by a wild boar whilst they were out hunting and the boar became the family’s emblem. In the churchyard of All Saints I came across this unusual medieval cross base which is thought to be the only surviving example of a Weeping Cross in the country. 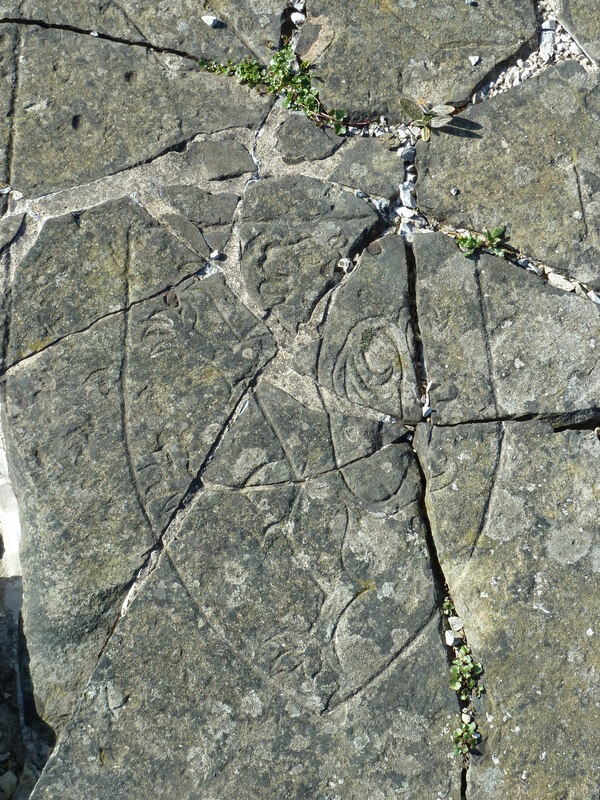 The exact age of the cross in unknown, but it is certainly as old as the church which was built in the 14th century and may have originally been connected with an earlier chapel, known as the Sinking Chapel. 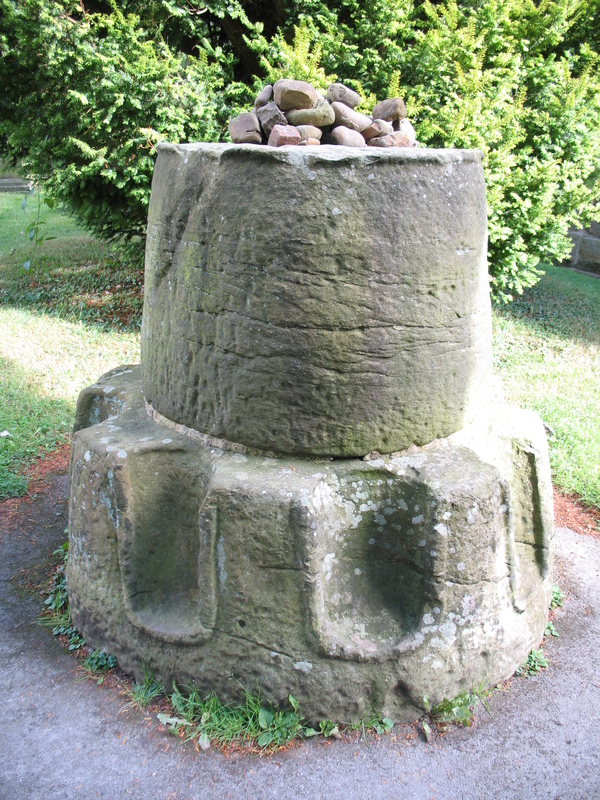 The stones on the top fill what was originally the base for a cross which has been lost. It may originally have been a crucifix and removed at the time of the Reformation. 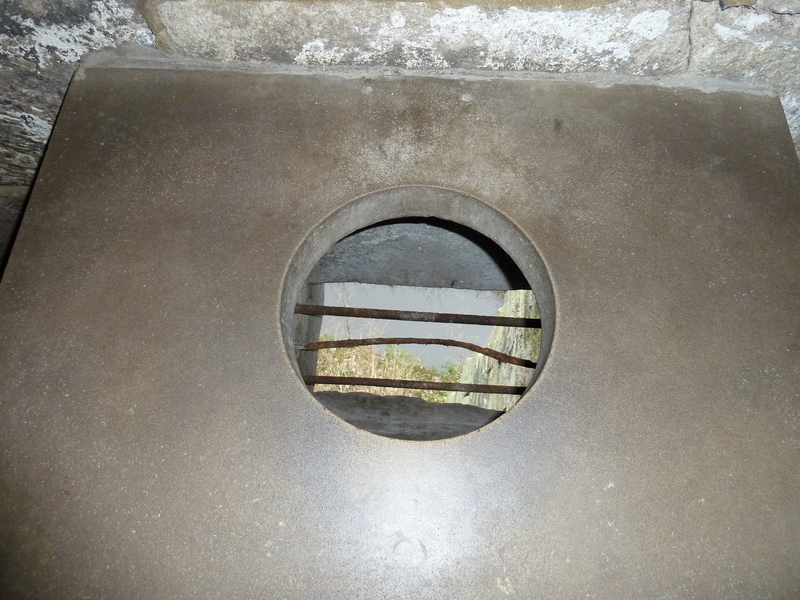 The eight recesses around the base were for kneeling penitents – not perhaps their knees as has sometimes been suggested but more likely for their heads as they knelt on the ground. The name ‘Weeping Cross’ seems to imply that it was a place of grief, remorse or repentance. 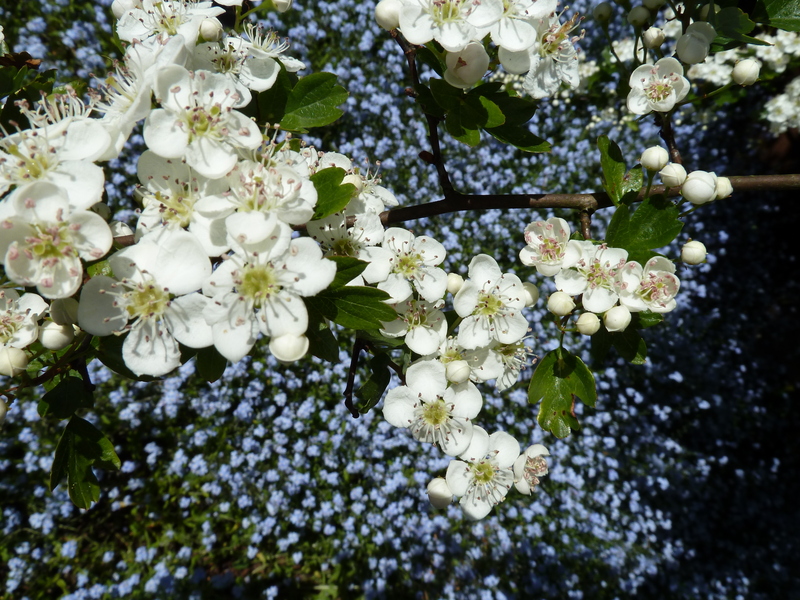 It is thought that it may have connections with the festival of Corpus Christi, though public penance for the atonement of sins was fairly common in the middle ages. I had an email the other day from someone who is also called Ashworth and is researching his family history. 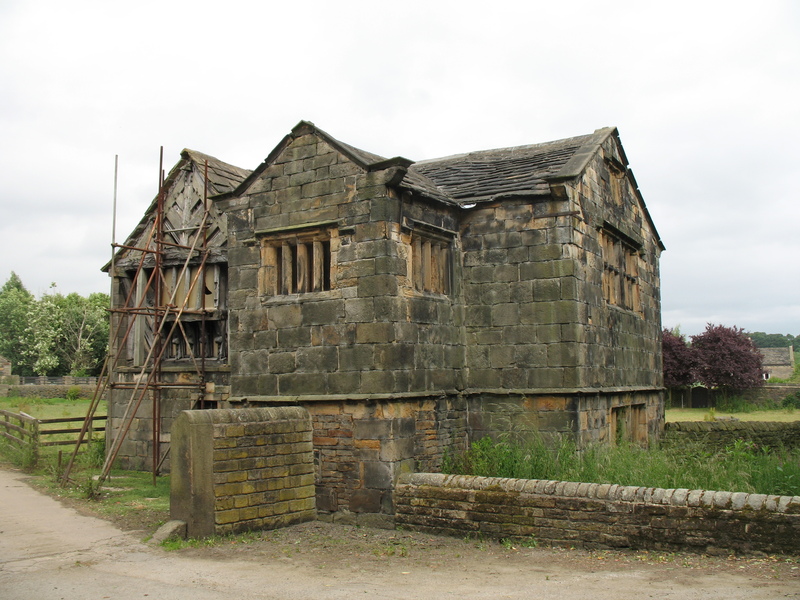 He mentioned some old charters and when I went to check I discovered that Ashworth – which is on the outskirts of Rochdale – was held of the Lord of Middleton and the earliest deed concerning it is a grant made about 1180–90 by Roger, son of Alexander de Middleton, to Geoffrey, son of Robert the Dean of Whalley, of the whole of Ashworth ‘for the service of 40d. yearly for sake fee’. One of the witnesses was a Jordan de Ashworth, who may have been the immediate tenant. Those of you who have read my novel, The de Lacy Inheritance, will know that Geoffrey de Whalley, the son of the Dean, is a central character and I like the idea that he was the overlord of people who may have been distant ancestors of mine. It seems appropriate that I should be writing about him and bringing the story full circle. I was also interested in the name Jordan de Ashworth. Jordan seems a modern name but it was in use back then and probably has connections with the Crusades. Crusaders sometimes brought back water from the river Jordan to baptise their children and that could have been the origin of this man’s name. Jordan and Tiffany. Not what you would expect as medieval names. I can already imagine the snarky comments I’ll receive from Amazon reviewers if my next novel has characters named after a couple of my forebears! I know that many of you are very interested in William Marshall after reading about him in Elizabeth Chadwick’s excellent books The Greatest Knight and The Scarlet Lion. Chateau Gaillard was built overlooking the river Seine by Richard I (Richard the Lionheart). It had three separate wards and was deemed to be impenetrable. During King John’s attempt to defend his lands in Normandy from the French, the castle was held by Roger de Lacy and for seven months he held out under siege. But his supplies were running low and in an attempt to conserve what food was left Roger expelled all the villagers who had taken shelter in the castle. The French army let some through but then received orders to prevent the rest leaving and many were left to starve or die of cold in the no man’s land between the two camps. This tragedy became known as ‘the useless mouths to feed’. Meanwhile the French eventually succeeded in mining the outer wall which collapsed and Roger de Lacy was forced to withdraw to the second ward. The one story that’s told about the taking of Chateau Gaillard is that the French eventually got into this ward through an unguarded toilet window that led to the chapel. Some historians dispute this and say that they simply broke into the badly defended chapel that had been added to the original plans by King John. But got in they did and Roger de Lacy and his men were forced to withdraw to the innermost fortification. This was surrounded by a water moat with a natural rock bridge that crossed it, but the besieging army used the bridge as cover to dig a tunnel that breached the final wall. The inner court was too narrow for the English to mount a defence and overwhelmed by superior numbers Roger de Lacy and his 129 knights were taken prisoner. It’s said that the French king, Philip Augustus, was so impressed by Roger de Lacy’s heroic defence of the castle that he saved him from being ‘run through’. He was ransomed for 1000 marks, paid by King John, and he returned to England. Leprosy, or Hansen’s disease (so named because it was G.H. Armauer Hansen who discovered, in Norway in 1873, that the bacterium Mycobacterium leprae was the cause) has been known to man for over 4000 years. The word leprosy comes from ancient Greek meaning ‘scaly skin’ or ‘scaly back’. Most people are naturally immune to the disease and nowadays it mostly affects people in developing countries where resources are scarce. It is not highly infectious and is probably transmitted through airborn droplets. After infection symptoms can take up to 20 years to develop and begin by affecting the nerves that control feeling in the skin. If left untreated, further nerve damage occurs and ulcers may develop. Because of the loss of sensation, wounds and cuts go unnoticed and the consequent damage leads to the visible signs commonly associated with leprosy. Leprosy appeared in Europe in the early 11th century and by the 15th century it had all but disappeared. It is thought that the disease may have been brought to Europe from Middle Eastern countries by those who had been on Crusade and it was regarded as being an upper-class disease rather than a disease of the poor. In fact early sufferers were pitied and treated well, but as the prevalence of the disease grew those with leprosy were reviled and seen as unclean and sinful. They were forced to carry a clapper, and later a bell, to warn of their coming so that people could avoid them and not come into close contact with them. A person with leprosy from a 14th century manuscript. The bell may have been to attract charitable donations as well as warning that a diseased person was in the vicinity. In the Middle Ages, many skin conditions were labelled as ‘leprosy’. These may have included such conditions as eczema, psoriasis and skin cancers and by the 12th century those with leprosy became regarded as unclean. Around this time many leper houses were built to keep sufferers separate from society as it was believed that the disease was very contagious. The Benedictine monk and chronicler, Matthew Paris, who lived from around 1200 to 1259, estimated that there were 19,000 leper houses in Europe, with 2000 being in France and over a hundred in England. These houses were run along similar lines to monasteries and convents and were for care as well as quarantine. In fact those with leprosy were sometimes viewed as experiencing purgatory whilst still on earth and their suffering was viewed as holy. The residents spent much time in prayer and, as it was also popularly thought to have been a sexually transmitted disease, the leper houses made the sufferers take a vow of chastity. Those who did not enter leper houses took the vows that are listed in the Mass of Separation including vowing not to enter any church or marketplace and not to touch the rim or rope of a well except with gloved hands. They were also excluded from inheriting. Famous sufferers include Baldwin IV, king of Jerusalem, who continued to rule despite his illness and Alice the Leper, a Cistercian nun who became a leprous martyr. There is also, of course, Richard FitzEustace, in my novel The de Lacy Inheritance, who is based on a real person. Many wealthy people in the middle ages gave donations to the leper houses and Roger de Lacy (who was Richard’s brother) gave land for a leper hospital on the banks of the river Ribble near Clitheroe. The site is now the Edisford Hotel near the bridge that spans the river. The hospital was named St Nicholas’s. Nowadays leprosy is curable with treatment by a multidrug therapy that combines dapsone, clofazimine and rifampicin. However the disease remains in parts of Africa, Asia and South America and there are still occasional cases of leprosy treated in the UK. I visit a lot of old churches and most of them have plain white walls. But they weren’t always like that. 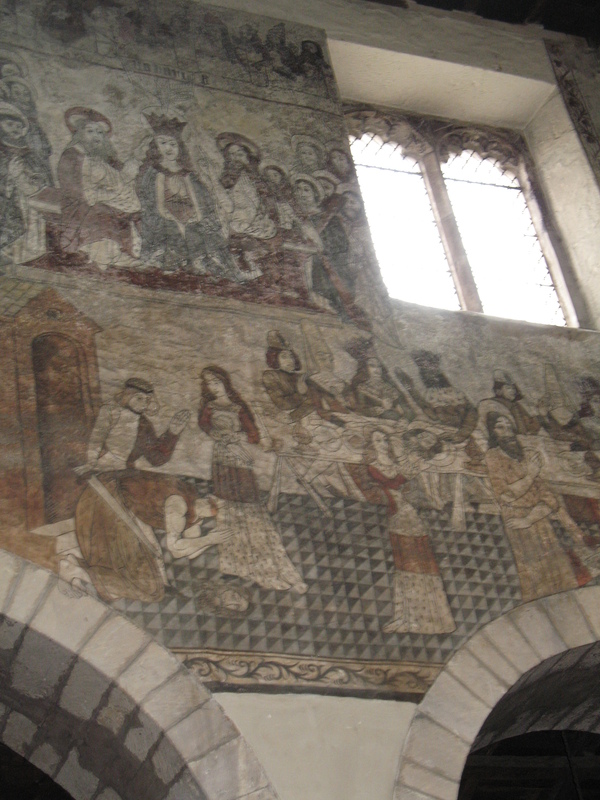 Before Henry VIII’s reformation the walls of the churches were painted with scenes from biblical stories and the lives of the saints. They were bright, colourful, informative and entertaining. 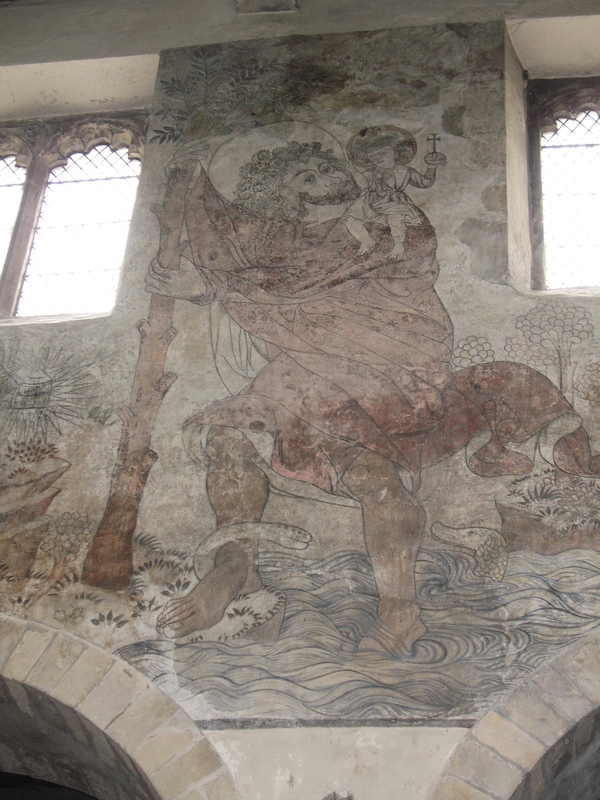 In fact wall paintings have been called the Bibila Pauperum – the poor man’s bible. In the days when many could people could not read, never mind afford to own something as expensive as a book, these paintings were used to educate and remind people about their faith. 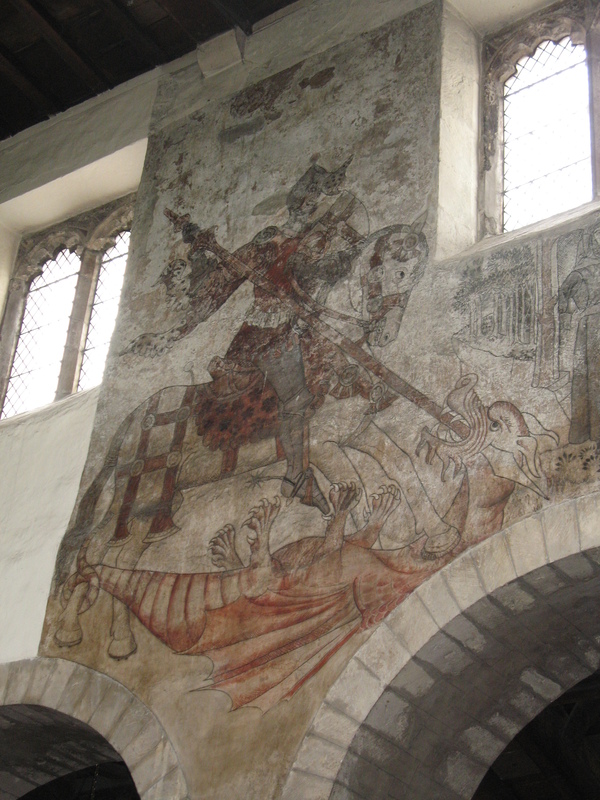 Sometimes you find churches that have some vestiges of wall paintings such as St Wilfrid’s in Ribchester, Lancashire, but the best example I’ve seen is at the church of St Peter and St Paul at Pickering in north Yorkshire. When I walked in I was overwhelmed by the extent and the condition of the paintings. 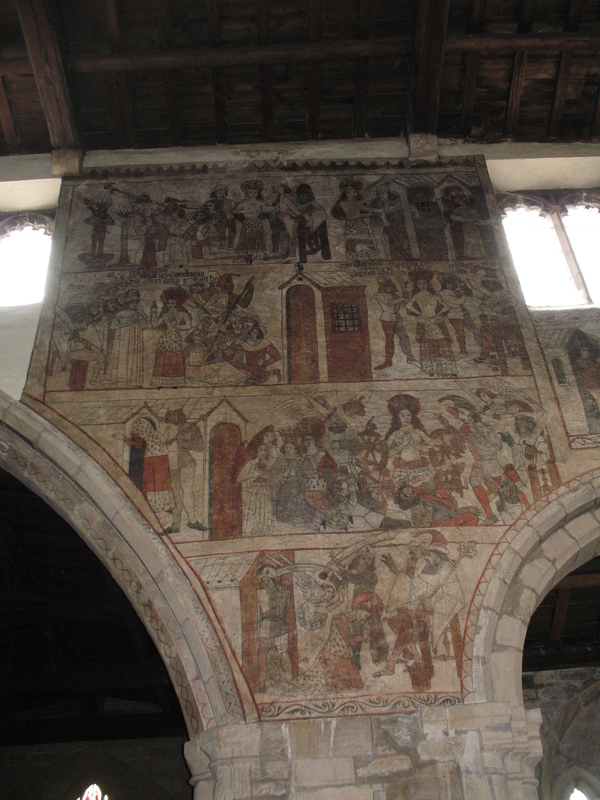 These paintings were commissioned around 1450 and painted over the next decade. Yet within a hundred years they had been covered and weren’t rediscovered until 1852 when a thick coat of plaster was removed from the walls of the nave. Many people came to see them, but they were subsequently whitewashed over as the vicar at the time, the Reverend F. Ponsonby, thought that they were a distraction from his sermons and ‘full of Popish superstitions’. However a later vicar, the Reverend G.H. Lightfoot, agreed that the paintings should be restored during renovations in 1876. Perhaps all these scenes of martyrdom helped people come to terms with the closeness of death in those times. Death from disease, in childbirth and in battle was common and people may have taken comfort from the stories of those who had also suffered but who had found their place in heaven. There is also a graphic picture that warns what will happen to those who descend into the jaws of hell. So the pictures also served as a warning to live a good life. It’s sad that so many other examples have been lost, but I was thrilled to see this one. Do go and have a look for yourself if you’re ever in the area. The real thing is much better than my photos. It was pouring with rain, but this huge standing stone, thought to be the tallest in Britain, was something I was determined to see for myself. 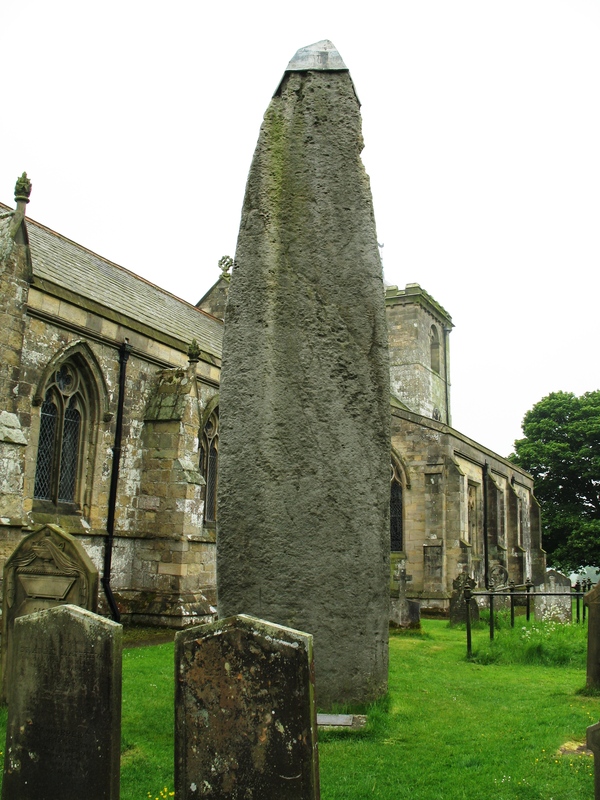 Standing around 26 feet above the ground and an uncertain but considerable depth below, this stone was brought to the site where it now stands in the churchyard of All Saints Church at Rudston in East Yorkshire during the late neolithic period, possibly as long ago as 2000 BC. The stone itself is a rough conglomerate moor grit and could have been brought from the Cleveland Hills. How this was achieved, given that it was transported before the invention of the wheel, is open to speculation though it could have been floated downriver on a substantial raft and then dragged up the hill to its final location. It would have had some sort of religious significance as it seems certain that the Christian church was built on the same site as an earlier place of pagan worship. 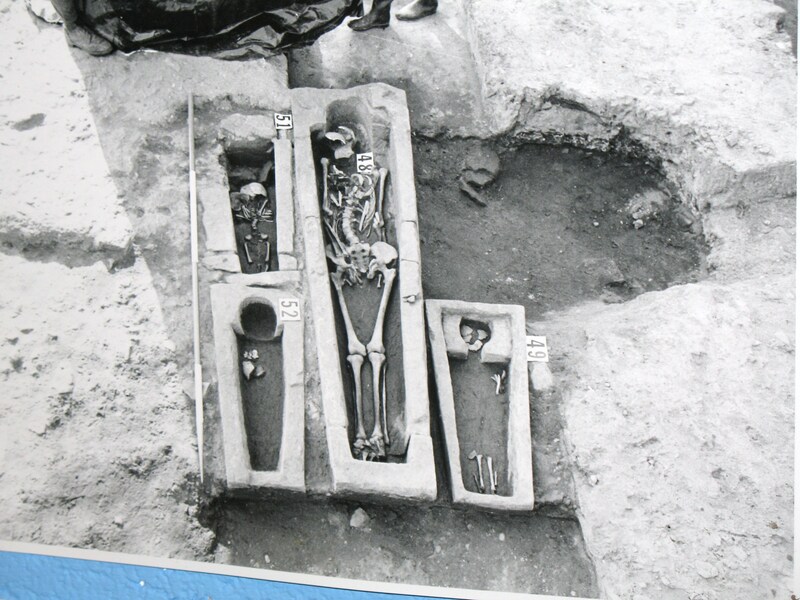 During excavations in the late 1700s by Sir William Strickland found many skulls nearby and there is speculation that this could have been a sacrificial site. Christianity came to Rudston in 615 AD. Edwin who was the chief of the Celtic tribe of Parisii had been given permission to marry Ethelburga if he and his Yorkshire tribe embraced the new religion of Christianity. After discussion the Elders and the priest of the tribe agreed and hundreds of people were baptised in the cold waters of the river Derwent at Yedingham. Better than being killed as an offering to the pagan gods! 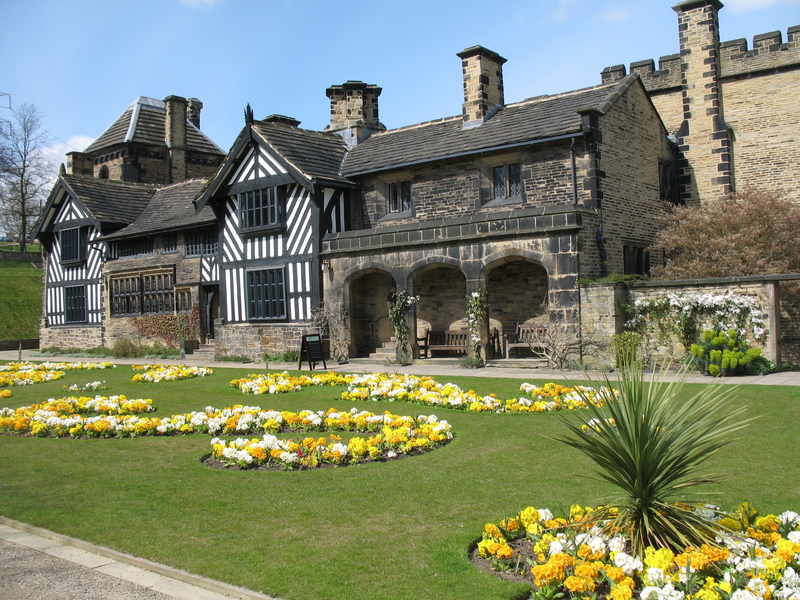 I went to visit Shibden Hall at Halifax today. It’s probably best known as the home of Anne Lister and as there’s a BBC drama about her life due to air this spring I thought I’d better go before the rush. 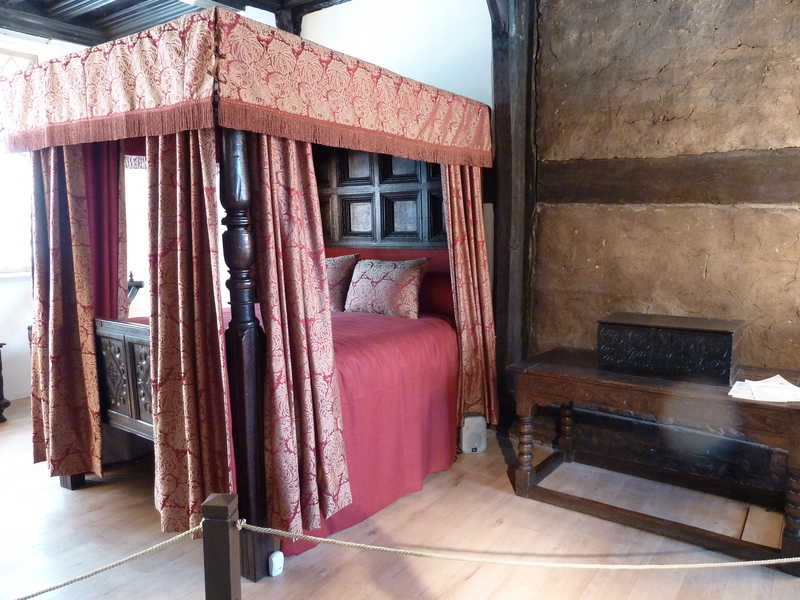 The hall was originally built in 1420 by William Oates and was a medieval timber framed manor house. 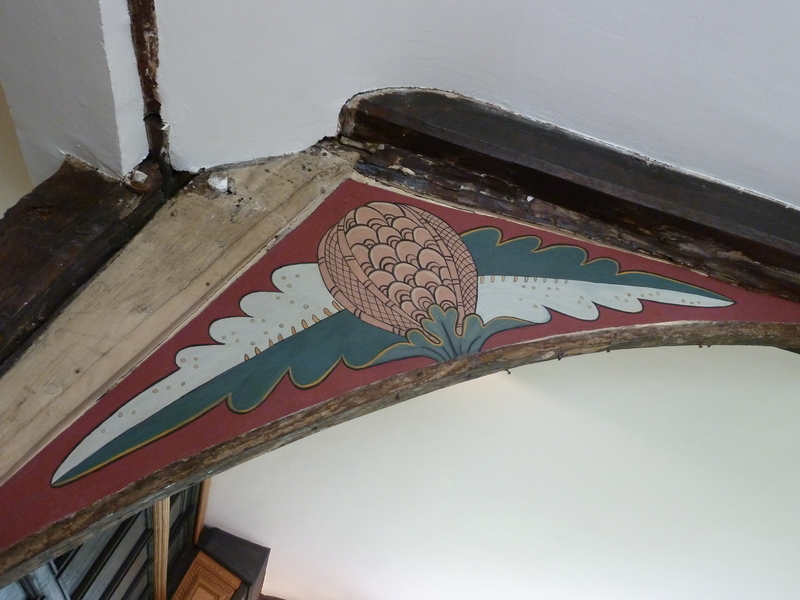 It’s changed since then, but the guide showed me some glimpses of the original house that can still be seen behind the later panelling – a huge oak beam supporting what was the original entrance, painted wooden panels in what is now the dining room and a huge fireplace hidden behind a smaller more modern one. 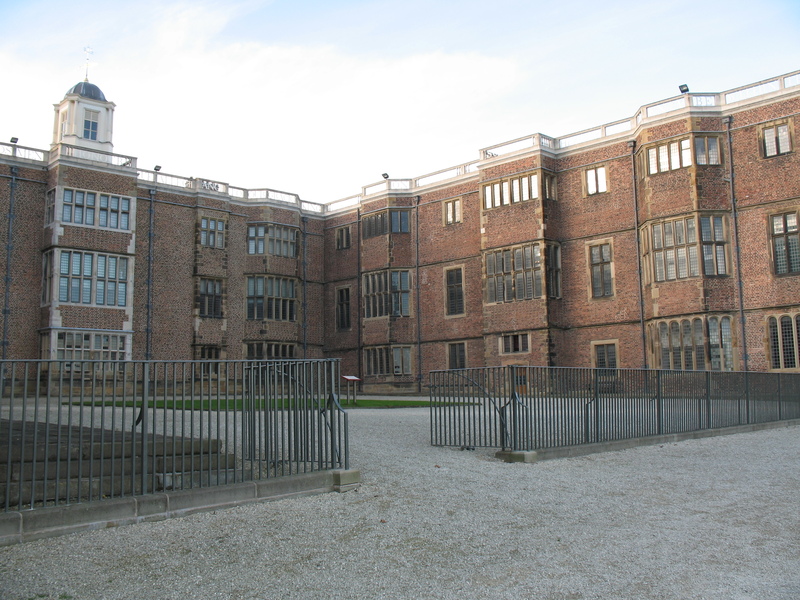 The hall passed to the Savile family and then the Waterhouses before being owned by the Listers for around 300 years. Anne Lister was responsible for the extensive alterations to the hall in the 19th century and also much of the landscaping in the garden which is now a very attractive park. As it’s only an hour’s drive from where I live I can’t understand why I’ve only just discovered it. I think it will definitely merit a second visit. 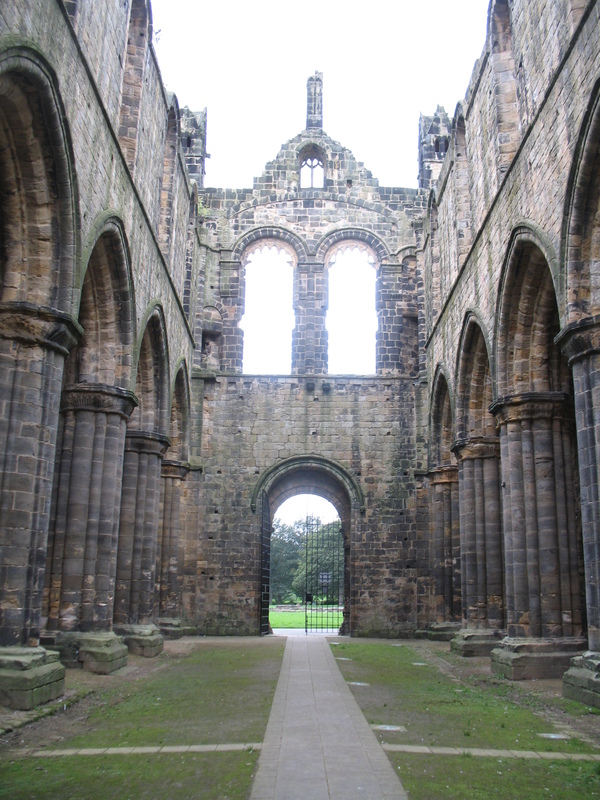 There’s a scene in my novel The de Lacy Inheritance where Richard stands outside the doors of the church at Kirkstall Abbey but is not allowed to go inside. I took part in a small re-enaction of that scene today when I went to visit Kirkstall but discovered that the remains are closed on Mondays. Although it was disappointing it was possible to see much of the abbey by walking around the outside of the railings, and by putting my hands through the bars I was able to get a fairly good selection of photos. When Henry de Lacy fell ill he vowed that if he recovered he would found a religious house. 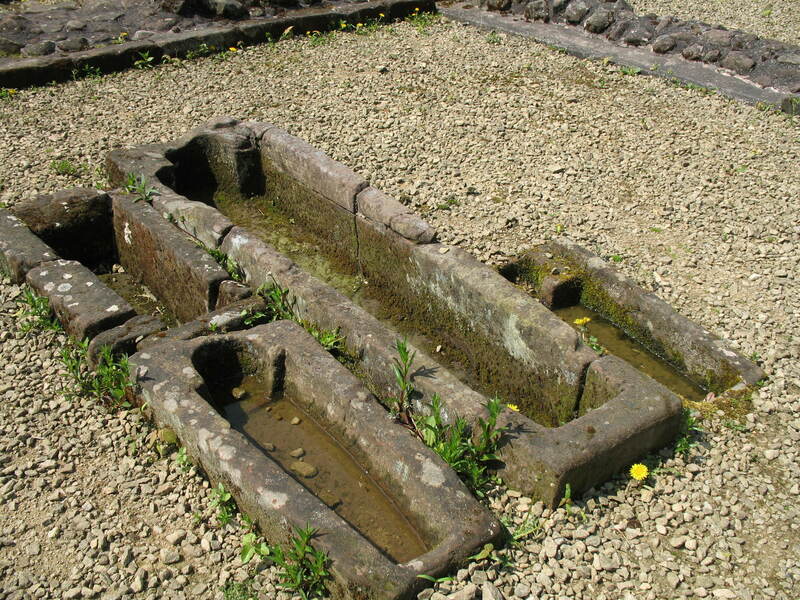 When he was well he helped monks from Fountains Abbey to found a new abbey at Barnoldswick, but the site proved unsuitable. 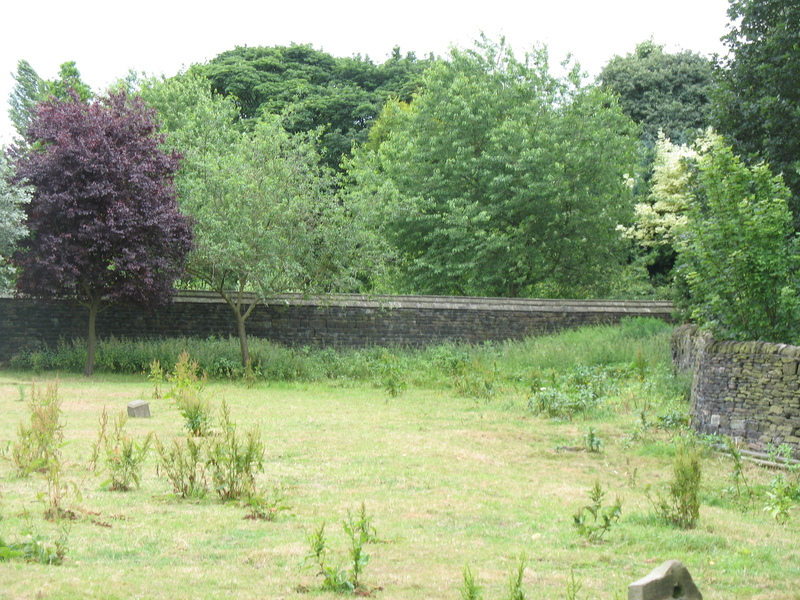 On 19th May 1152 the monks came to the new site at Kirkstall. The land had belonged to William Peitevin, who held it of Henry de Lacy, but it is Henry who is recorded in the foundation history as being the driving force behind William’s grant of this land to the monks. 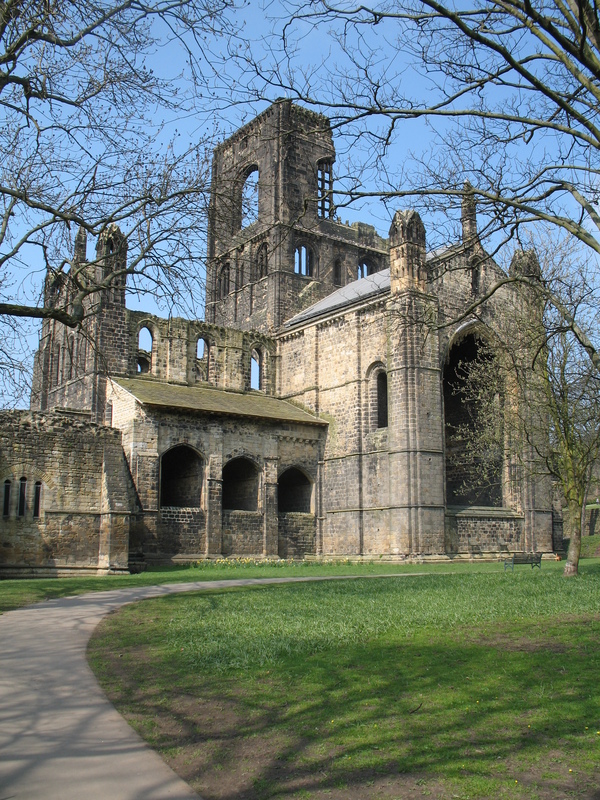 Kirkstall Abbey is one of the most complete examples of a medieval Cistercian abbey in Britain. As all Cistercian abbeys are built to a similar floorplan it is comparable with Fountains Abbey as well as Byland Abbey and Whalley Abbey amongst others. The other attraction of Kirkstall is that it is free to visit (as long as you don’t go on a Monday or a Friday) so I will definitely be going back when it is open to have a better look! 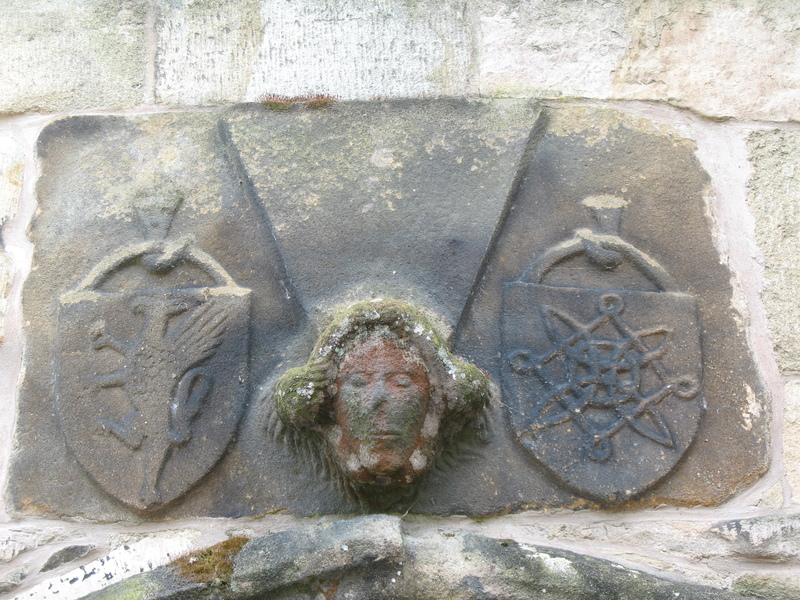 During my research into the life of Henry de Lacy, Earl of Lincoln, I discovered that when he granted the monks of Stanlaw Abbey (founded by his great, great grandfather John around 1172) permission to move to Whalley one of the conditions that he stipulated was that the remains of his ancestors should be taken from Stanlaw and reburied in the new Abbey church at Whalley. 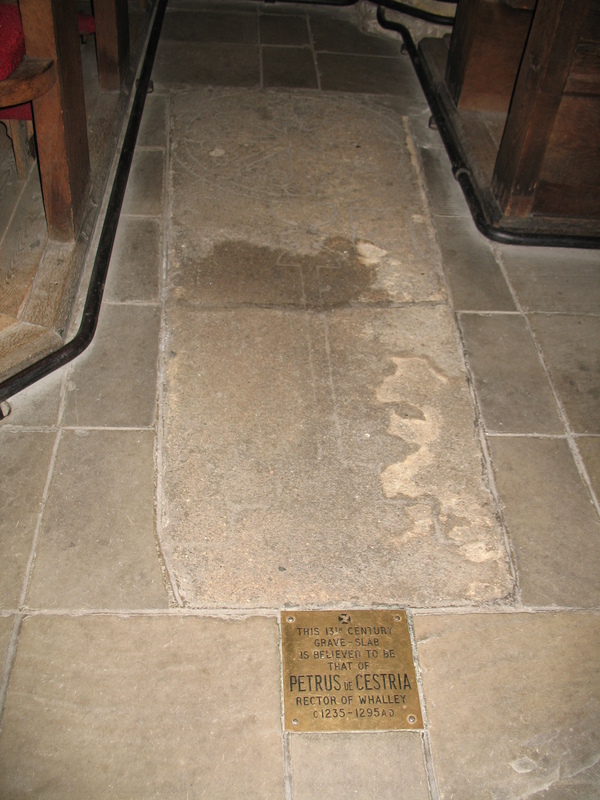 The move was quite a long time coming as the monks were unable to move until after the death of Peter de Cestria in 1296. There were other problems and it was not until 1306 that the ground was consecrated and in 1308 Henry de Lacy himself laid the foundation stone of the church. This afternoon I was wandering amongst the ruins of the abbey when I noticed the remains of a huge stone slab, which looked as if it was a tombstone, within what was once the abbey church. 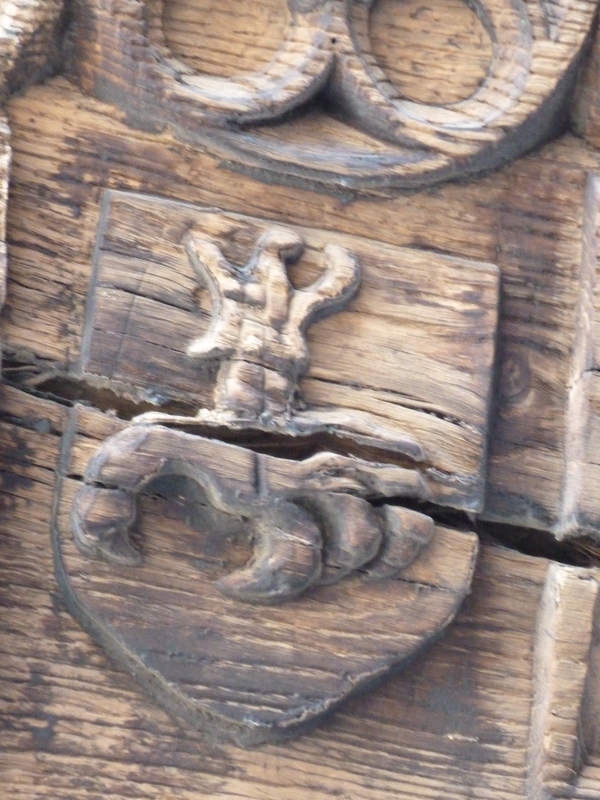 It clearly bears the arms of the de Lacy family -the rampant lion. 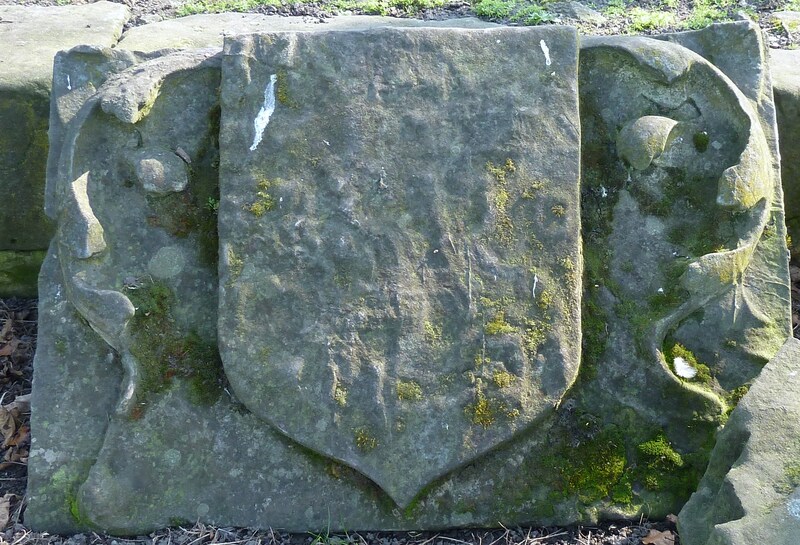 The shield is etched to the left of what looks like a cross and it seems reasonable to surmise that another shield, possibly that of the Barons of Halton, was on the right hand side. If this is indeed a stone that marks a grave then is it possible that this is where the remains of Henry de Lacy’s ancestors lie? I was in York last Monday afternoon. It was a showery day and around four o’clock there was a sudden downpour that sent everyone dashing for shelter. From the doorway of the art gallery I turned as the sun came out and looking up at the cloud dark sky I was rewarded with a vivid rainbow which appeared to come down onto the Minster. Rainbows make me think of a variety of things. Beauty. A sense of wonder. A reminder that we are living on a sphere which turns in space. God’s promise after the flood. And the rhyme I was taught so many years ago to help remember the colours. Richard Of York Gave Battle In Vain. Red, orange, yellow, green, blue, indigo and violet. Richard of York was a descendant of Edward III and after he had acted as Protector during the mental illness of Henry VI he pressed his superior claim to the throne. 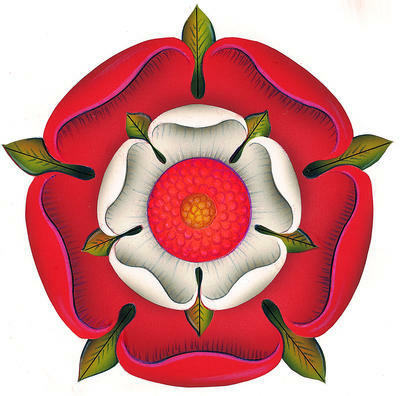 On 7th October 1460 parliament agreed that the crown should pass to York and his heirs after the death of Henry VI. But Henry’s wife, Margaret of Anjou, and her supporters were unhappy with this decision and raised an army to defeat the Duke of York by force. This was the beginning of what are now called the Wars of the Roses. Facing uprisings by the Lancastrians, Richard of York sent his eldest son, Edward, the Earl of March, to put down a rebellion in Wales and he marched north to Sandal Castle, in Yorkshire, with his second son, Edmund, the Earl of Rutland. No-one is sure why he left the castle on 30th December 1460, but the result was the Battle of Wakefield where he was hacked to death by his enemies and his seventeen year old son was murdered as he tried to escape the carnage. Both their heads were left to rot on Micklegate Bar in York following the Lancastrian victory. 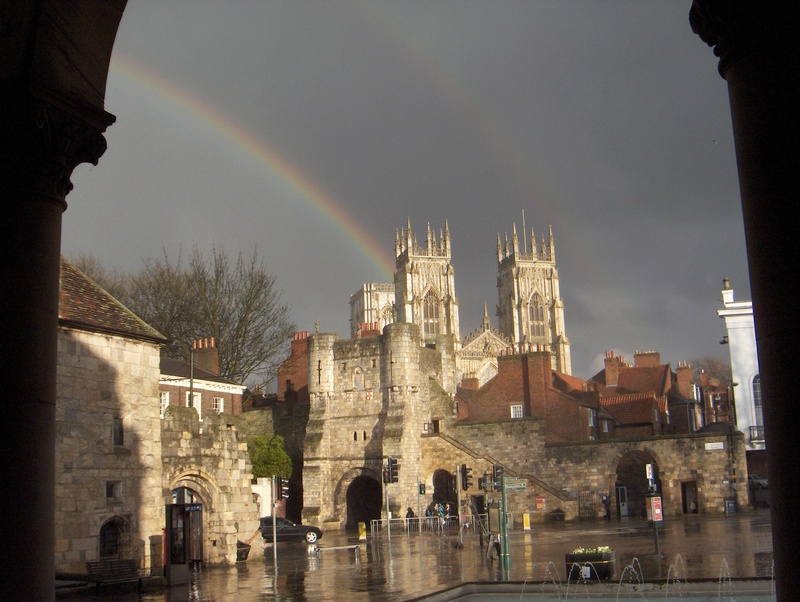 So the rainbow over the Minster left me with feelings of both delight and sadness as I considered some of the history connected with the city and the dynasty of York. Today is Mothering Sunday. It is a Christian festival which falls on the fourth Sunday in Lent and celebrates ‘mother church’. On this day people would return to worship at their mother church which was often a cathedral or large parish church. It was the place they had been baptised and where their family came from so it would also have been a day for family reunions. It was this that became the tradition of allowing servants to go to their family homes on this Sunday to visit their mothers and it was this that led to it becoming a celebration of motherhood as well. There was also a slight relaxation of the Lenten fast and traditionally Simnel cake was eaten on this day which is why it is also sometimes known as Simnel Sunday. 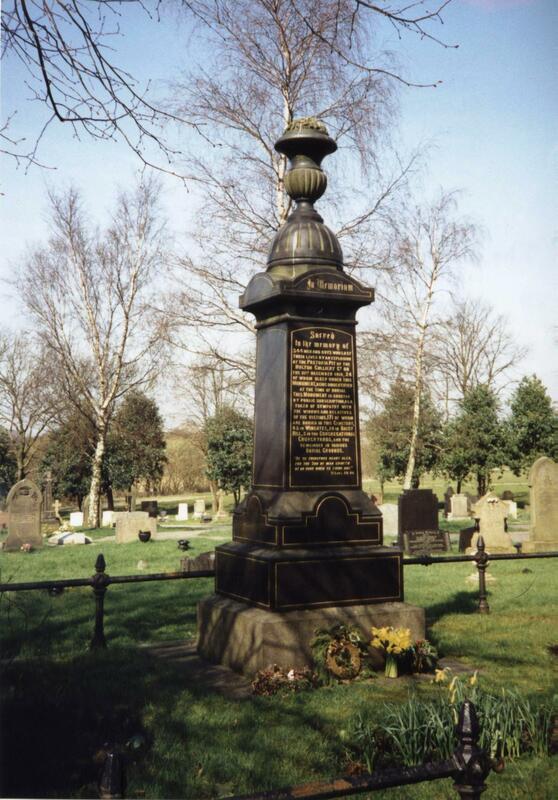 Here’s another interesting grave that I didn’t have room to include in my bookLancashire: Who Lies Beneath? 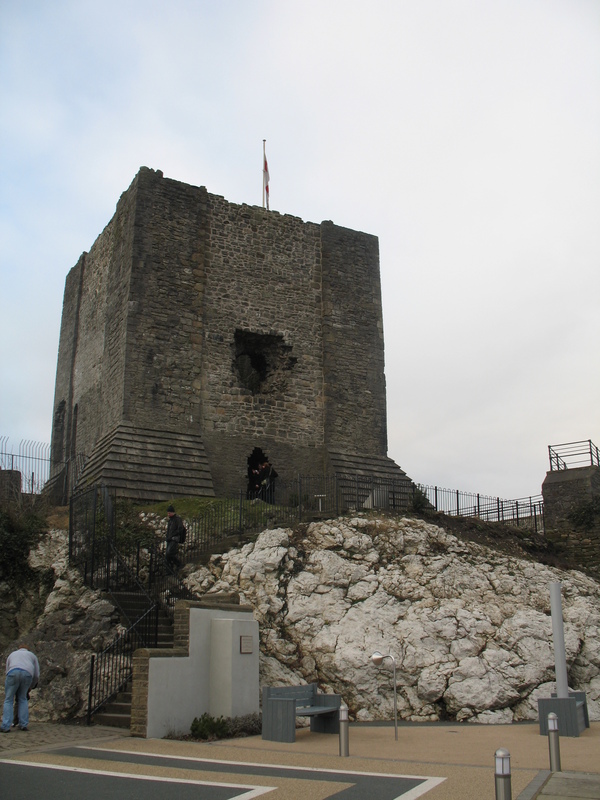 I went to Clitheroe Castle this afternoon. It’s been on my mind since I spent last weekend giving The de Lacy Inheritance a final edit. 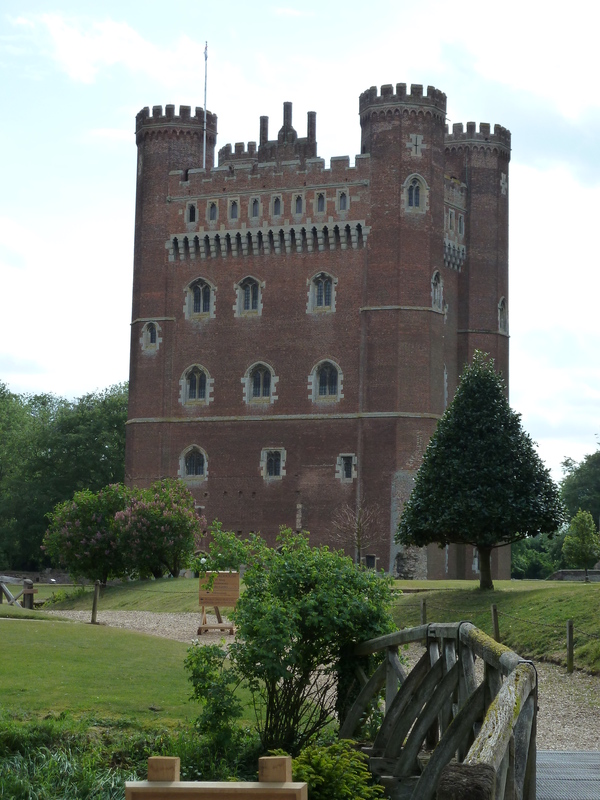 There’s been a castle on the site since shortly after the Norman Conquest. 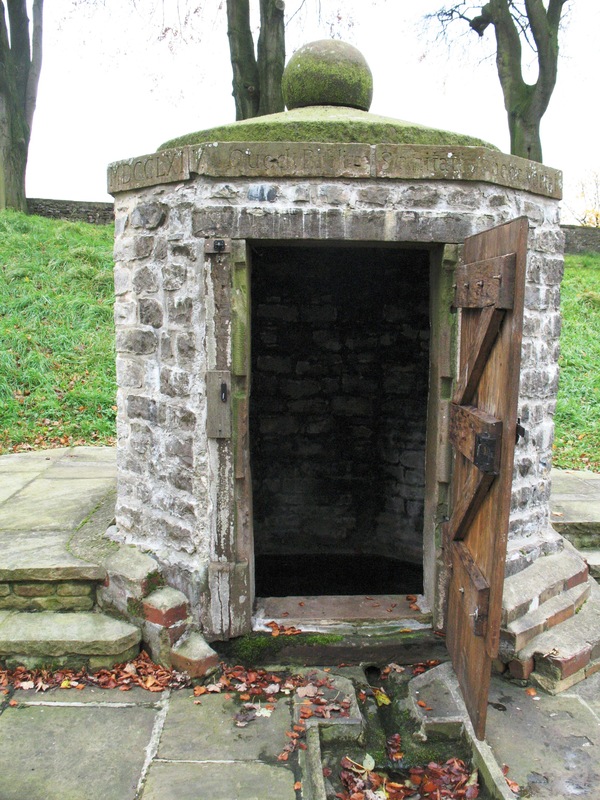 The original would have been a timber structure and this stone keep was built around 1187 by Robert de Lacy, so at the time my novel is set it was only a few years old. Much of the story is set in and around the castle and in the photo below you can clearly see that it is built on an outcrop of limestone. The small keep originally stood within a protective curtain wall with a gatehouse to the eastern side and within the bailey there were other buildings (possibly wooden) including the chapel of St Michael. Sadly no trace of these remain. 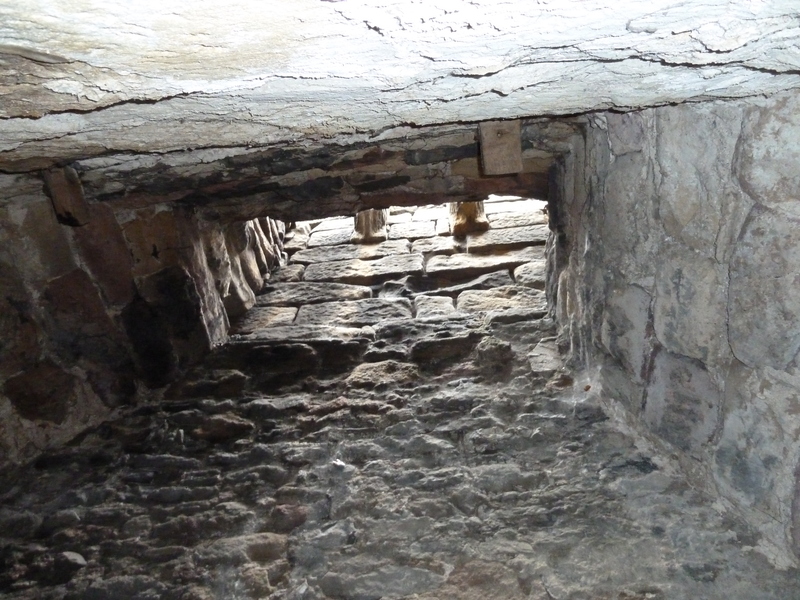 There are a couple of stories that account for the hole in the side of the keep. One says that the devil through a rock from Pendle Hill. The other says it was made by Cromwell’s army so that the castle couldn’t be used as a stronghold against them. 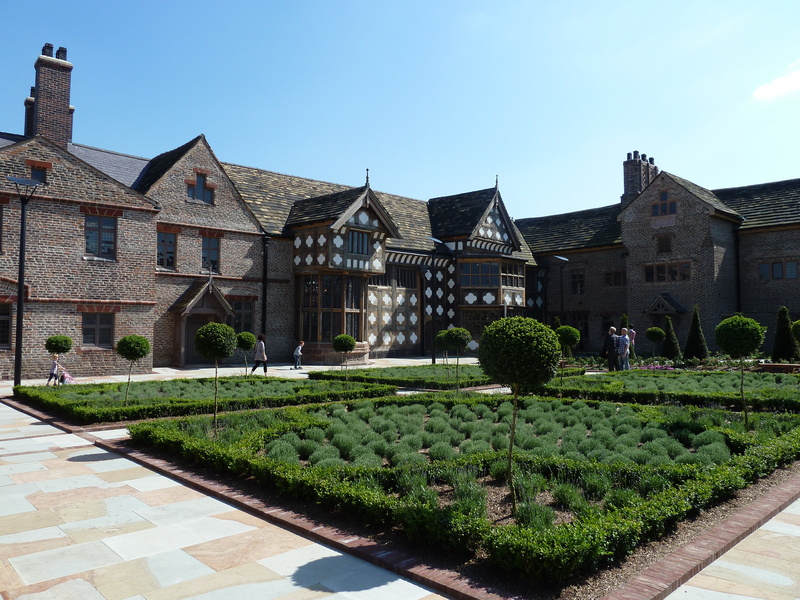 The site has recently undergone some redevelopment and now has a new and very interesting museum that has a range of exhibits about the history of the area as well as the castle. I have just recently commenced searching my family tree. My grandmother was born a de Lacey, She had a brother Count Francis De lacey, after whom my father & I were named. He died in June 1950. He did not have any family himself, his sister married David Speechley and had 4 children. We have been told that Speechley’s originated in Normandy, France and were involved with the de Lacey’s at the time of the battle of Hastings. And now we find that they have married into the de Laceys. It certainly is a strange & complicated world. I would love to study your books as they sound very, very interesting. I do not know which line Francis came down as there are a number associated with various European families. He was the last one to hold the title “Count” in Australia.. I intend to source out your books, and would like to have contact with you again in the future.